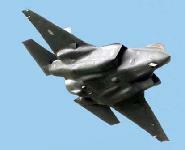 Joint Strike Fighter поднялся в воздух. 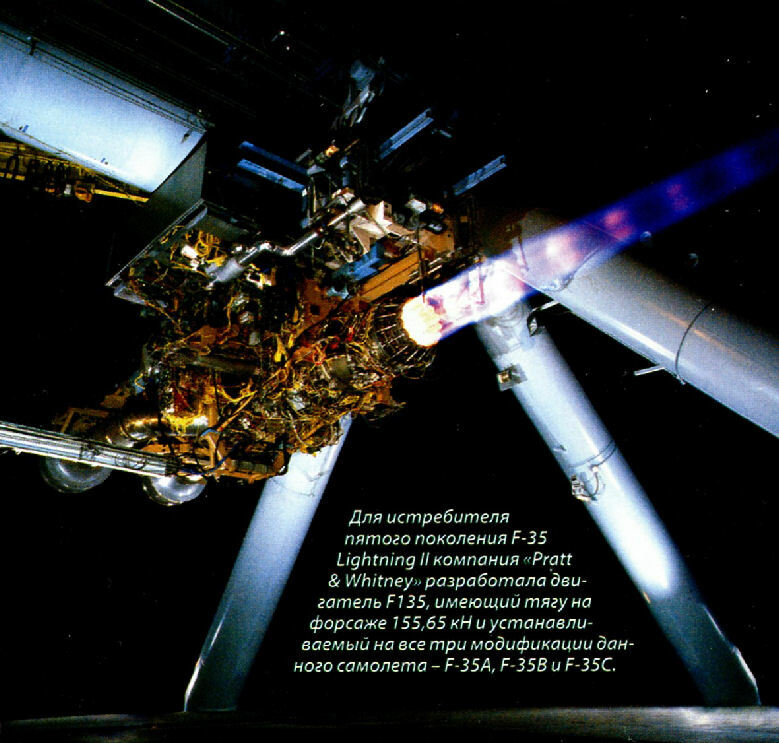 15 декабря 2006г. 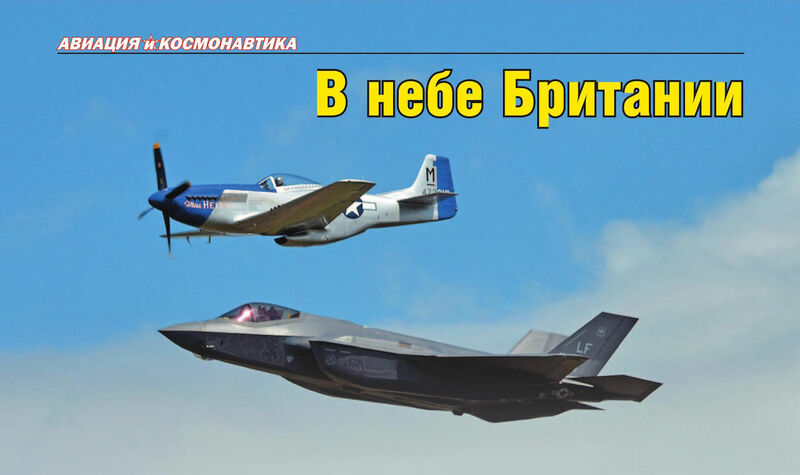 : в Форт-Уорте, Техас, взлетел первый самолет Joint Strike Fighter (JSF) - прототип будущего истребителя для ВВС многих стран НАТО. 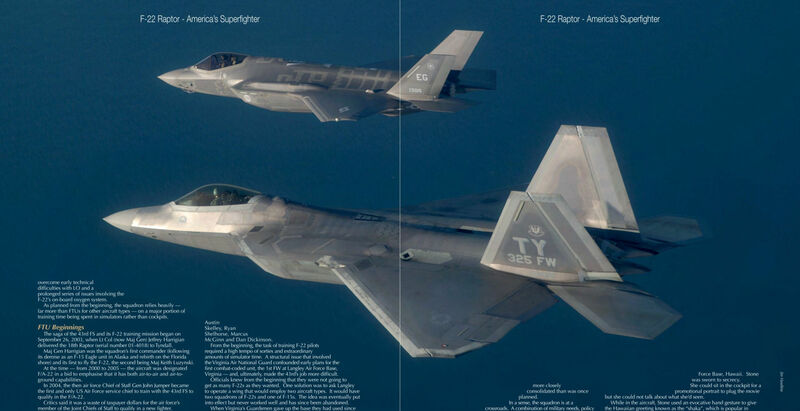 Первым из истребителей пятого поколения фирмы "Lockheed-Martin" стал самолет F-35A Lightning II (AA-1) - вариант JSF, предназначенный для ВВС США. С первым его полетом началась программа испытаний, названная "самой всесторонней в истории авиации". 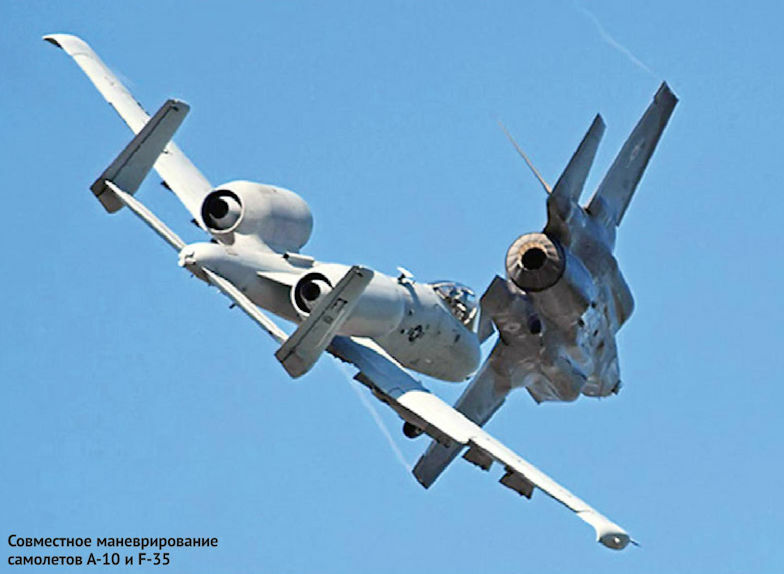 Самолет-невидимка F-35 предназначался для замены машин F-16, Harrier, A-10 и старых версий F/A-18 Hornet. Летчиком-испытателем в историческом полете был Джон Бисли. 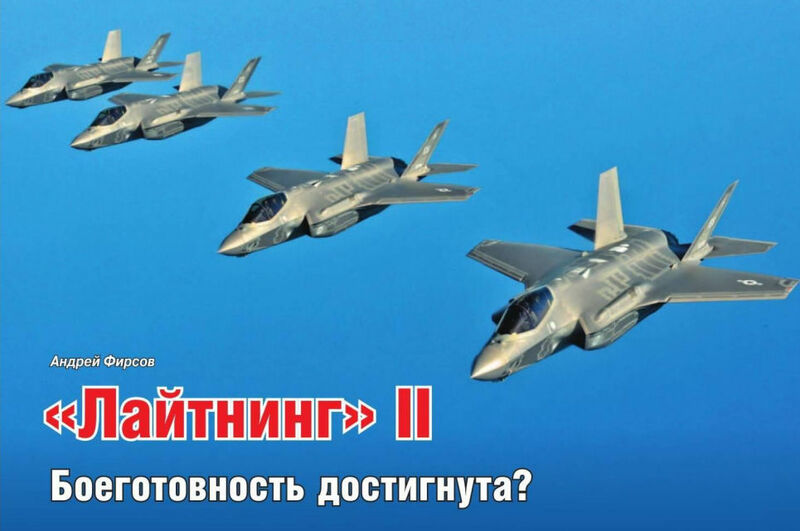 Он заявил: "Lightning II летает прекрасно. Это отличное начало программы летных испытаний и заслуга людей, интенсивно работавших, чтобы добиться этого". 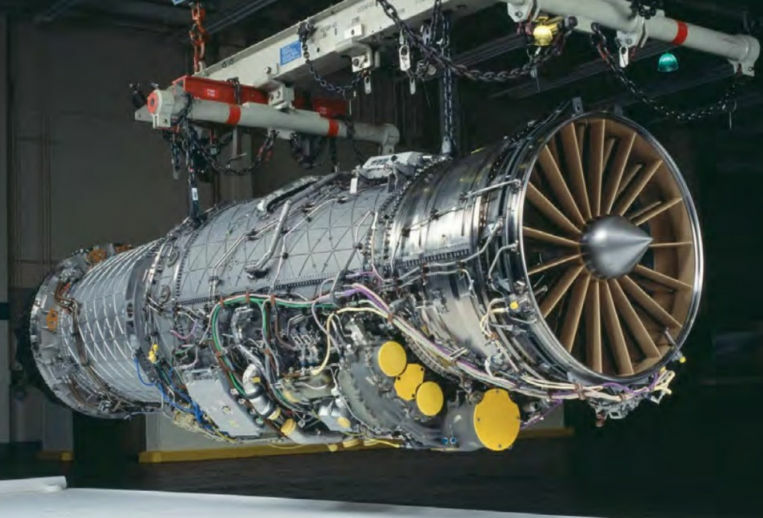 Оснащенный турбовентиляторным двигателем Pratt & Whitney F135 самолет F-35 поднялся на высоту 4572 м, затем выполнил ряд маневров для проверки управляемости и функционирования силовой установки. 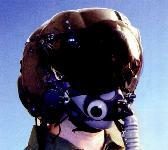 Lightning II сопровождали истребители F-16 и F/A-18. 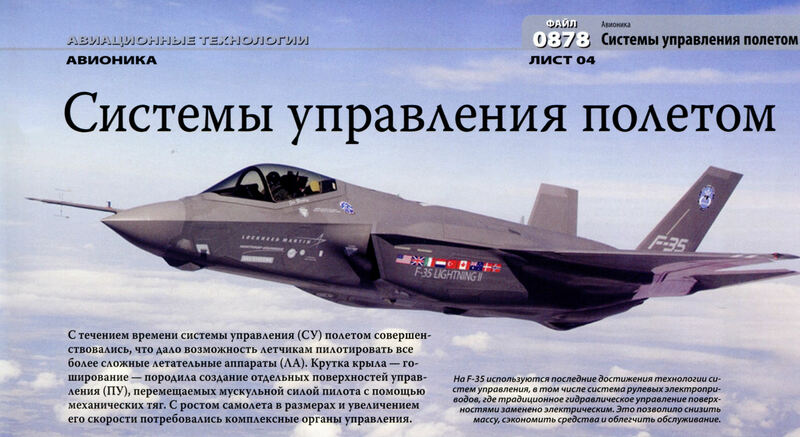 К моменту первого полета в программе JSF участвовали КМП, ВВС и ВМФ США, а также ВВС и ВМФ Британии. Все вместе они планируют приобрести 2581 такой самолет. С этой программой сотрудничают Австралия, Канада, Дания, Италия, Нидерланды, Норвегия и Турция. 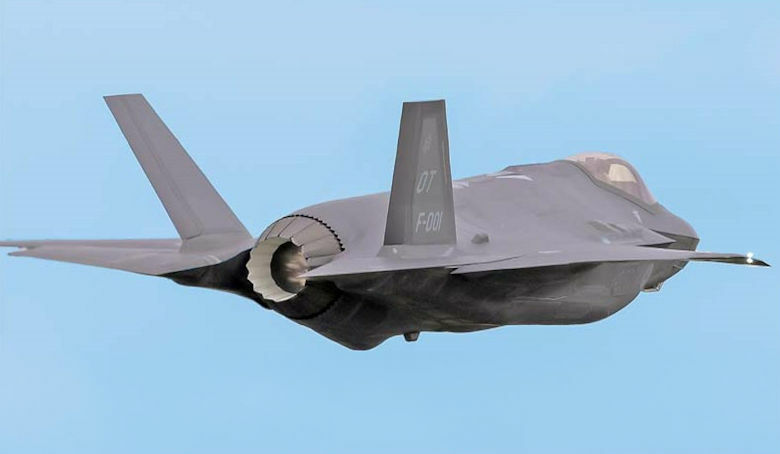 После обычной версии JSF должен появиться вариант F-35B с коротким разбегом и вертикальной посадкой (КВВП), а также палубный вариант F-35C (CV) для ВМФ США. 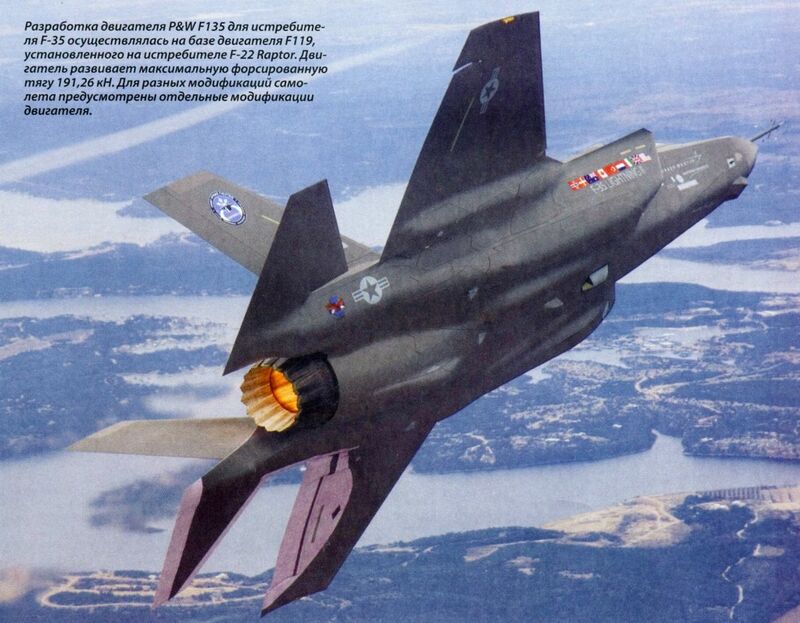 По флагам различных стран мира, изображенным на воздухозаборнике F-35A, можно заключить, что программа JSF является международной. 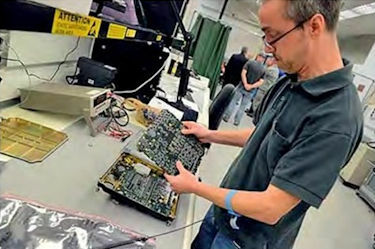 Несколько стран инвестировали немалые суммы в разработку самолета. На F-35 используются последние достижения технологии систем управления, в том числе система рулевых электроприводов, где традиционное гидравлическое управление поверхностями заменено электрическим. Это позволило снизить массу, сэкономить средства и облегчить обслуживание. 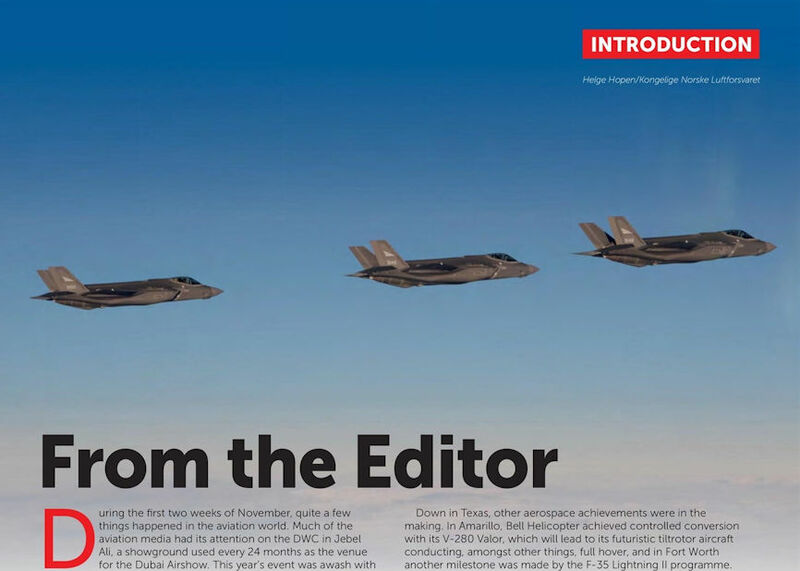 Следом за первым опытным F-35A, AA-1,к программе испытаний в период до 2011 года присоединились 13 других F-35 - четыре F-35A (AF-1 - AF-4), пять F-35B (BF-1 - BF-5) и четыре F-35C (CF-1 - CF-4). 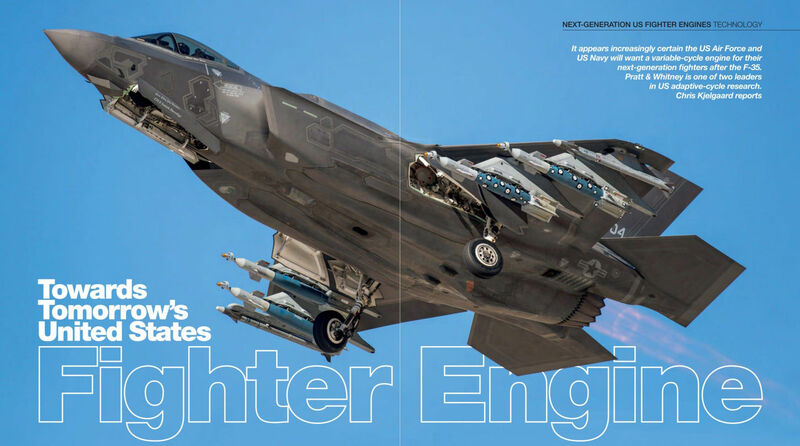 Ожидается, что F-35 Lightning II станет первым созданным по стелс-технологиям боевым самолетом, который поступит в массовое производство. 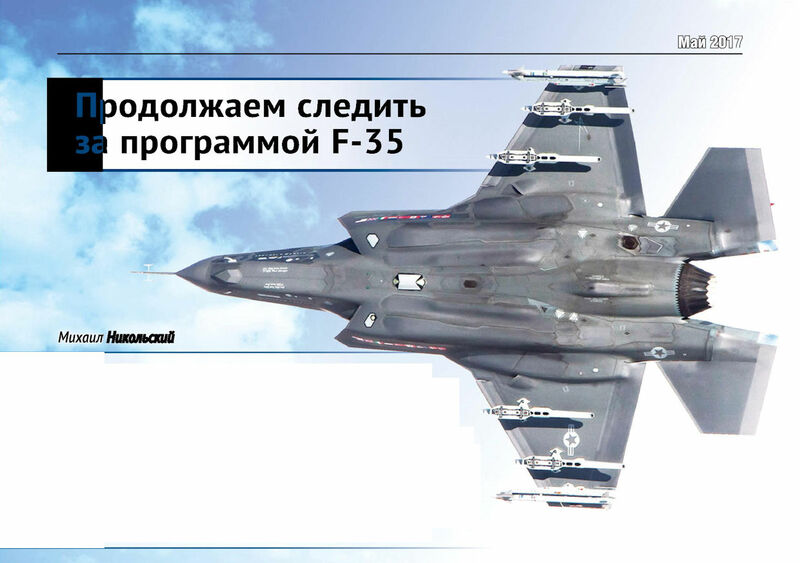 Программа F-35 считается самой дорогостоящей в истории. 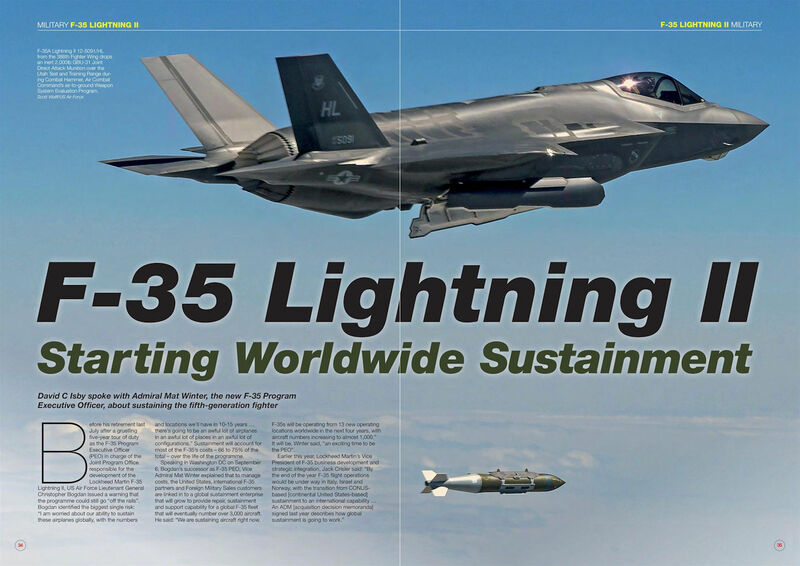 Italy is due to receive 60 F-35A Lightning IIs. 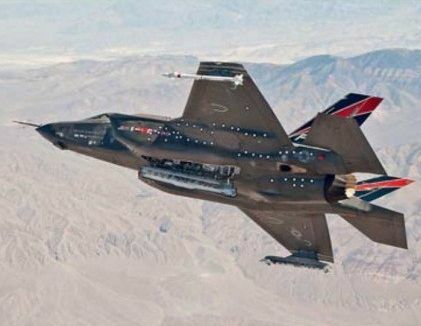 F-35A test aircraft AF-01 loaded with four 2,000lb GBU-31 Joint Direct Attack Munitions on a September 27, 2016 loads-flutter test flight from Edwards Air Force Base, California. 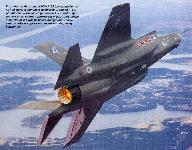 This was the first flight with externally loaded GBU-31s. 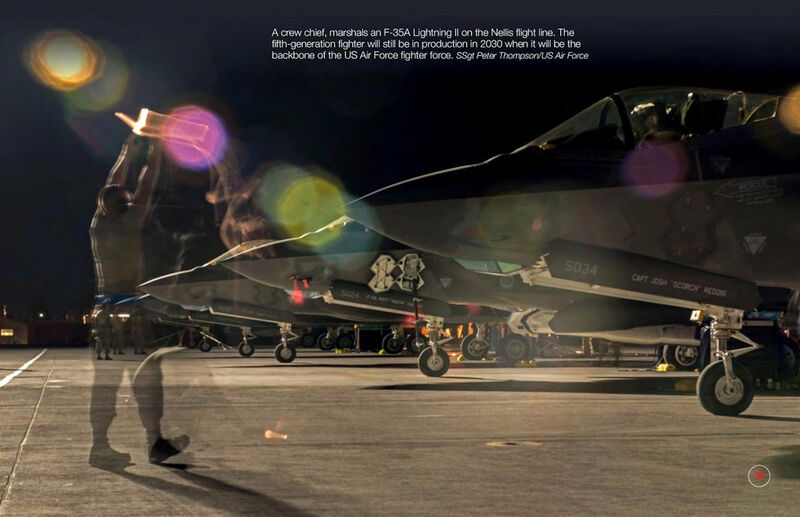 Lockheed Martin F-35A Lighting II AF-01 flown by Lt Col George ‘Boxer’ Schwartz, the F-35 Integrated Test Force director, completed the first in-flight missile launch on June 5, 2013. The aircraft fired an instrumented AIM-120 Advanced Medium Range Air-to-Air Missile (AMRAAM) within the Point Mugu Sea Test Range over the Pacific Ocean. 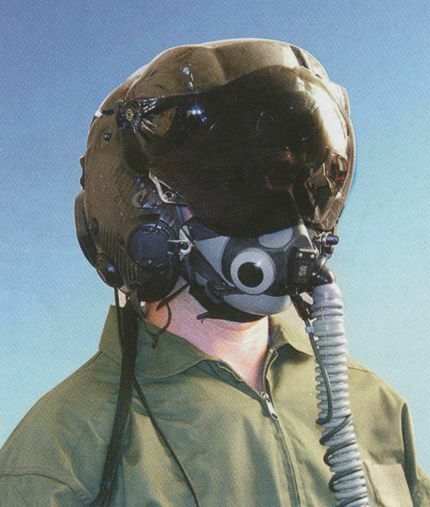 This was the first time the aircraft had demonstrated a launch-to-eject communications sequence and ignited the weapon's rocket motor. 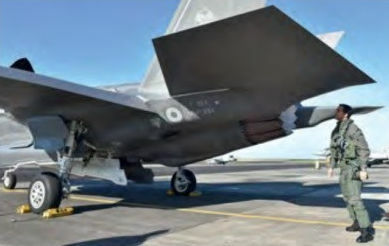 An AIM-120 was first 'dropped' from the F-35A on October 19, 2012, during a separation trial, but its rocket was not fired. 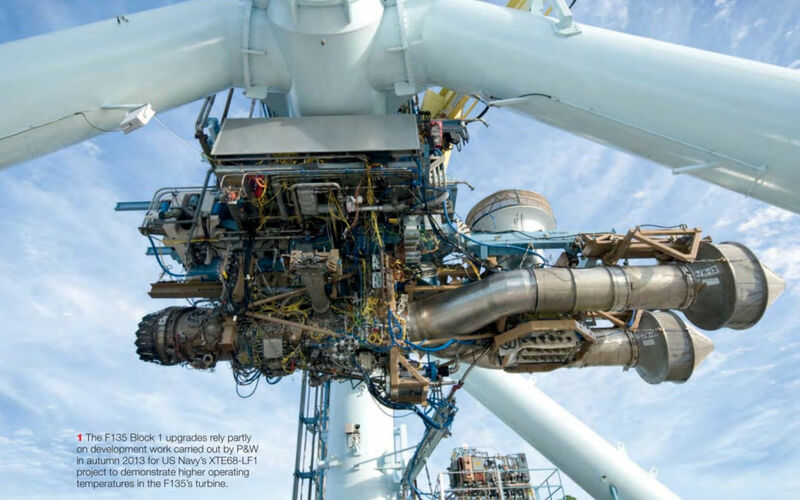 The latest trial was undertaken as part of the aircraft's Block 2B software tests prior to its service introduction later this year. 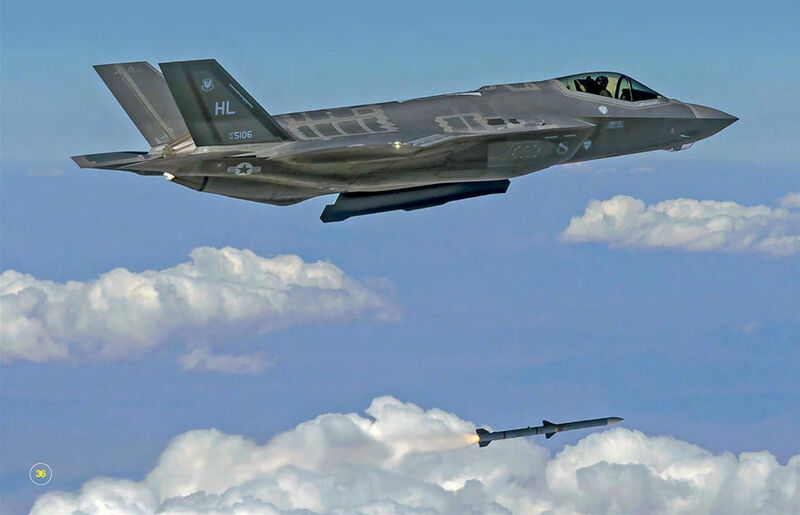 Lockheed Martin F-35A Lightning II 07-0744/‘ED’ (b/n AF-6) of the 461st Flight Test Squadron, 412th Test Wing, completed the first live-fire launch of a guided air-to-air missile over a military test range off the Californian coast on October 30, 2013. 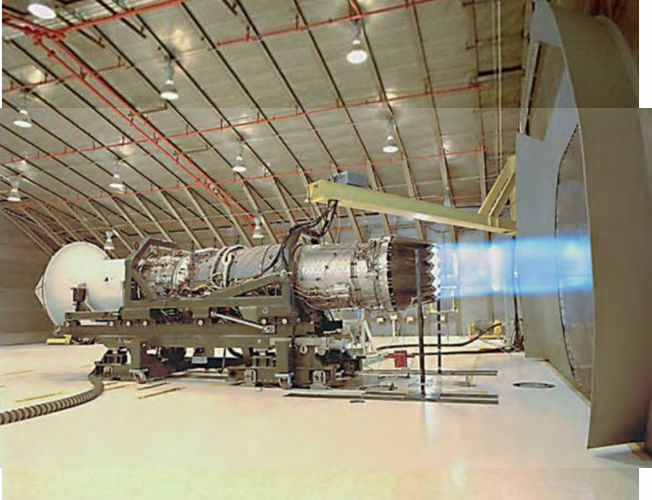 Operating from the unit’s base at Edwards AFB, California, the jet launched an AIM-120 advanced medium-range air-to-air missile (AMRAAM). 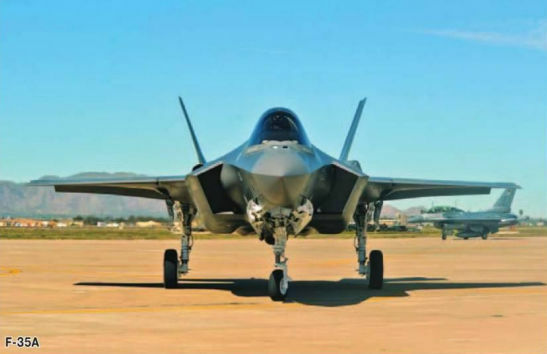 Lockheed Martin F-35A Lightning II 10-5009/'0T' taxies at Nellis AFB, Nevada, after arriving on March 6, 2013, one of the two assigned to the 422nd Test and Evaluation Squadron (TES) delivered that day. 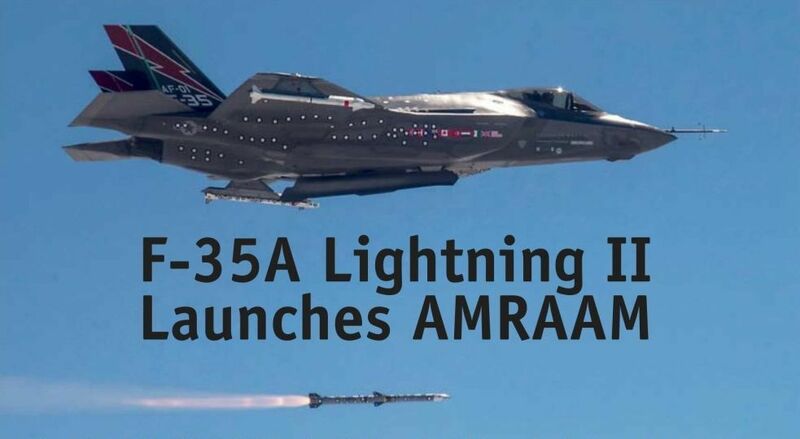 They are the first of 12 to be delivered to the unit for operational testing, which will be conducted under the control of the 53rd Test and Evaluation Group at Nellis and at Edwards AFB, California. 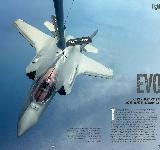 The last of six aircraft for the 31st TES at Edwards are due to be delivered in the summer. 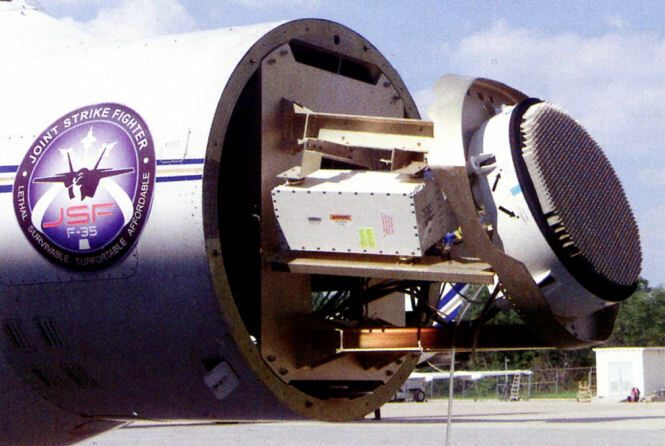 This shot shows the serrated panels on the forward fuselage, the faceted window assembly of the AAQ-40 Electro-Optical Targeting System and the fuselage form at the engine inlet. 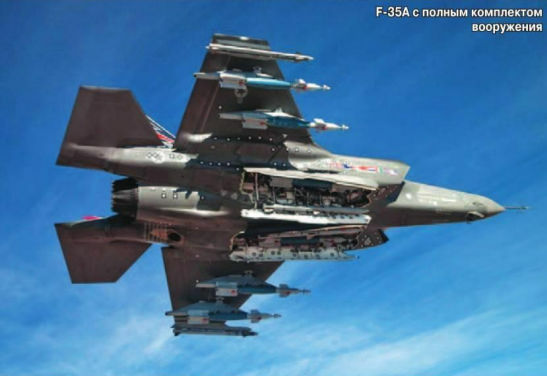 The F-35 Integrated Test Force is conducting final weapons separation tests for the Block 2B software using all three variants of the JSF. 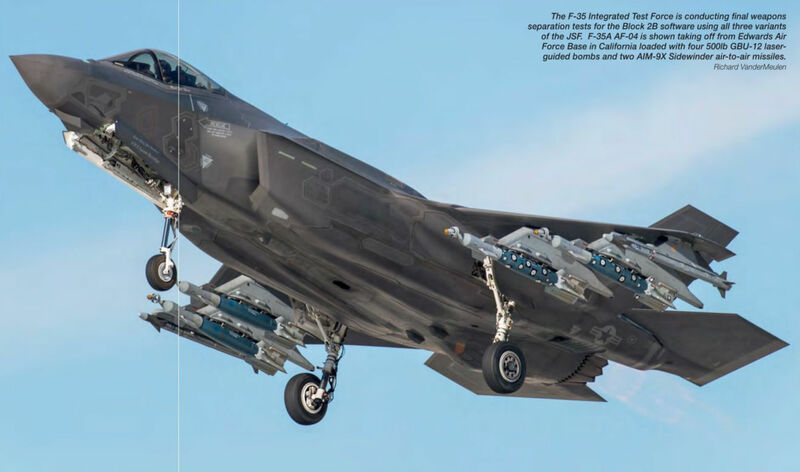 F-35A AF-04 is shown taking off from Edwards Air Force Base in California loaded with four 500 lb GBU-12 laser-guided bombs and two AIM-9X Sidewinder air-to-air missiles. 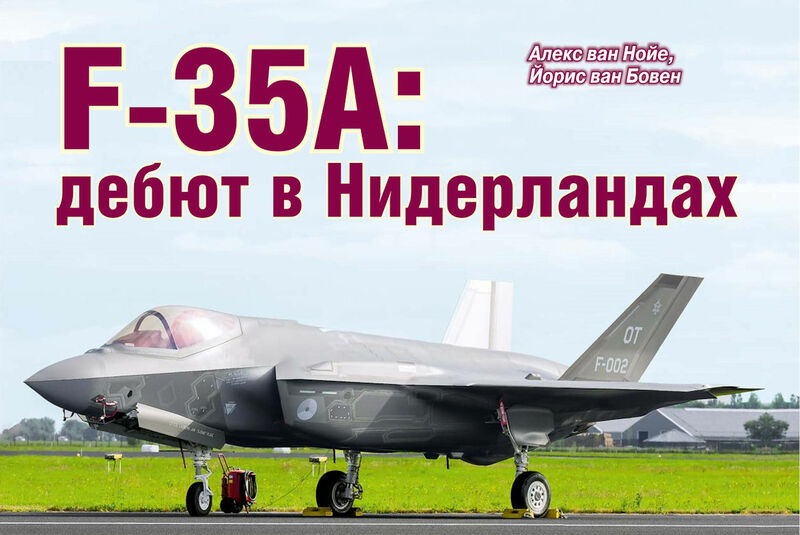 Существуют три базовые модификации F-35: F-35A (на снимке) - вариант для ВВС США, КМП должен получить самолеты с укороченным взлетом и вертикальной посадкой - STOVL F-35B, а палубный F-35C с увеличенным крылом должен поступить как в КМП, так и в ВМС. 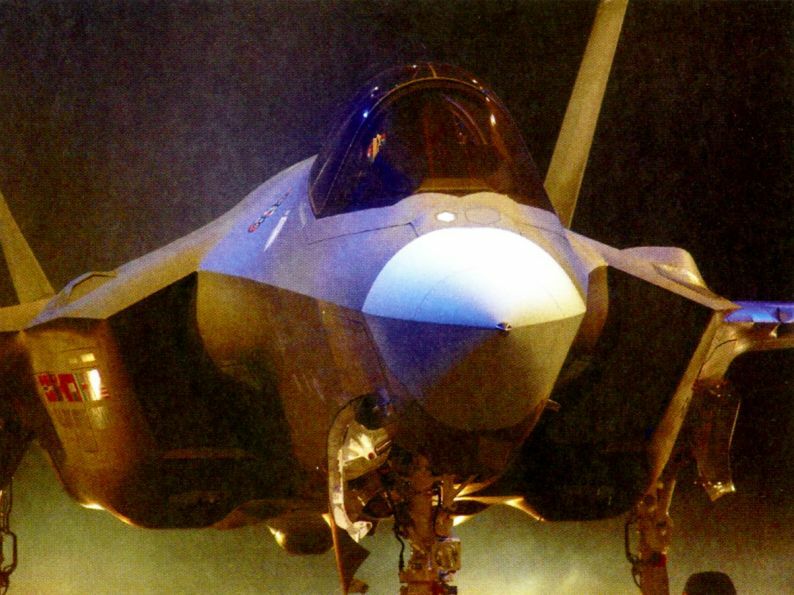 Все зарубежные покупатели заказали F-35A, за исключением Израиля (желающего получить уникальный вариант F-35I), ВМС Италии (F-35B) и Великобритании (F-35C). 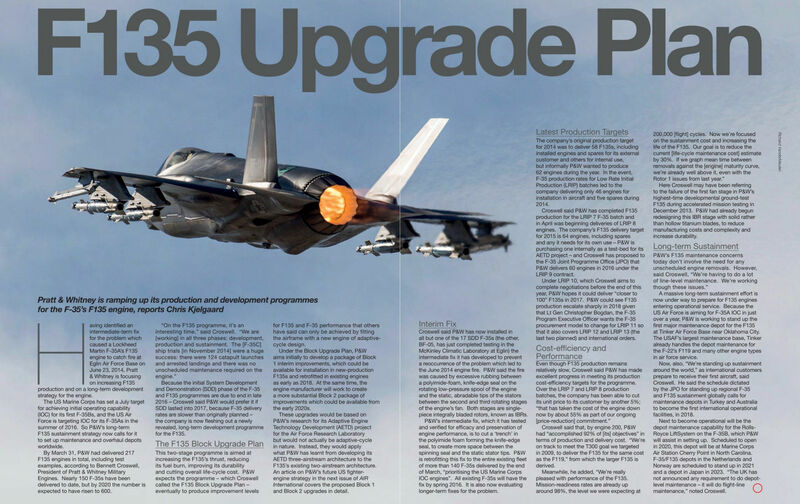 The F-35 is the most important acquisition programme for the Italian Air Force, which is due to acquire 60 F-35As and 15 F-35Bs. 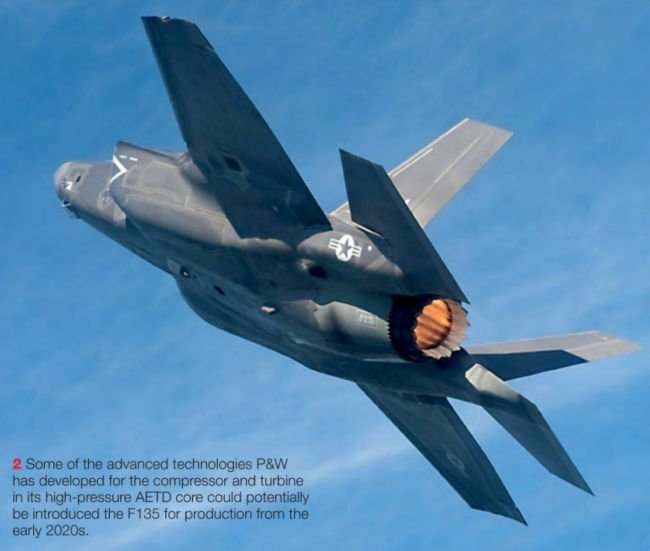 F-35A System Development and Demonstration aircraft AF-02 during the first airborne gun bursts. 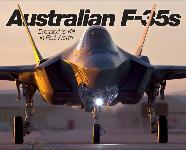 Australia has ordered two F-35A Lightning IIs and committed to 14 aircraft. 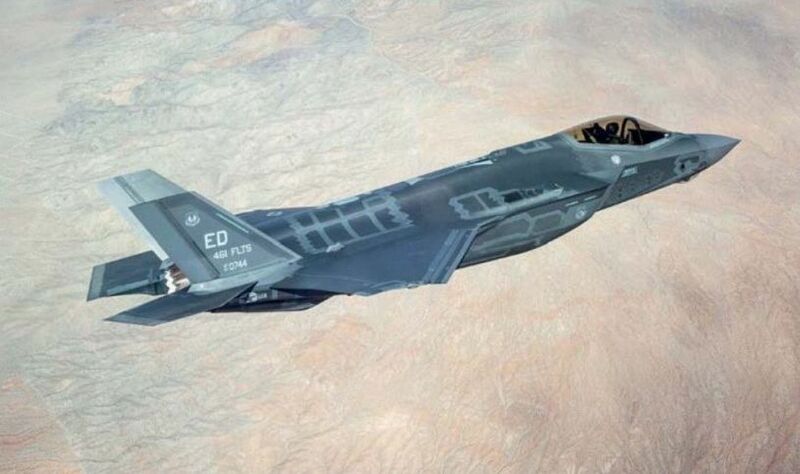 US Air Force F-35A Lightning II 12-5049/‘WA and 16WPS’ (AF-60) departs Nellis Air Force Base, Nevada on February 12, 2015. 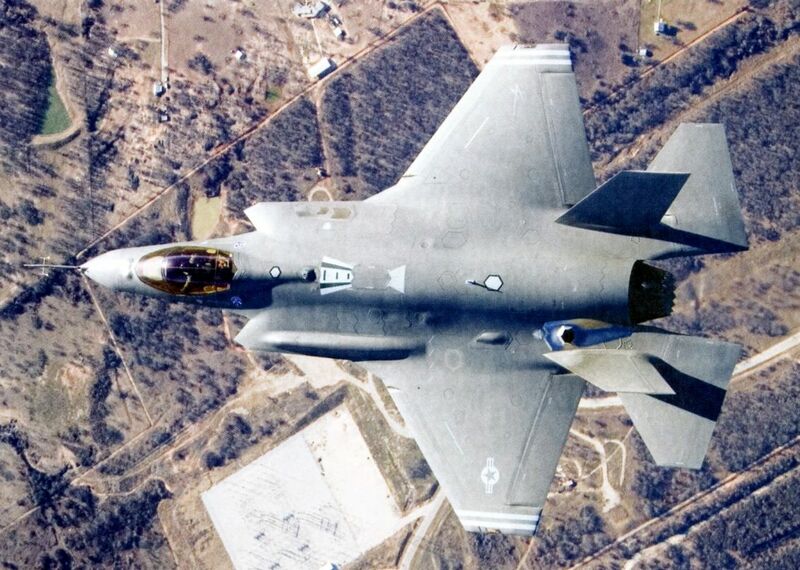 F-35A 07-0744/‘ED’ is marked with the number plate of the 461 st Flight Test Squadron on its tail fins. 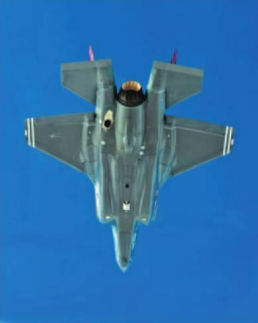 The aircraft is seen over one of the Edwards AFB ranges during a test flight. 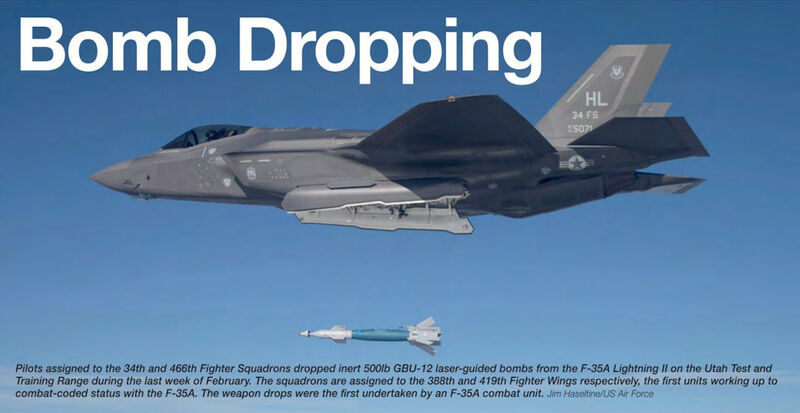 Pilots assigned to the 34th and 466th Fighter Squadrons dropped inert 500 lb GBU-12 laser-guided bombs from the F-35A Lightning II on the Utah Test and Training Range during the last week of February 2016. 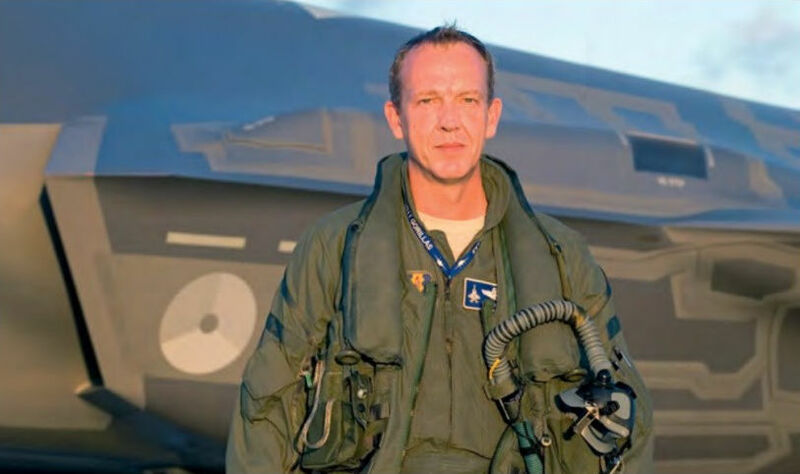 The squadrons are assigned to the 388th and 419th Fighter Wings respectively, the first units working up to combat-coded status with the F-35A. 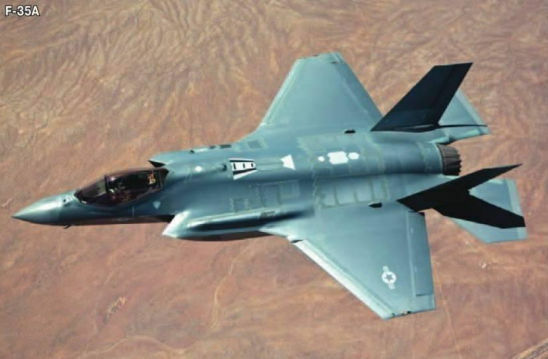 The weapon drops were the first undertaken by an F-35A combat unit. 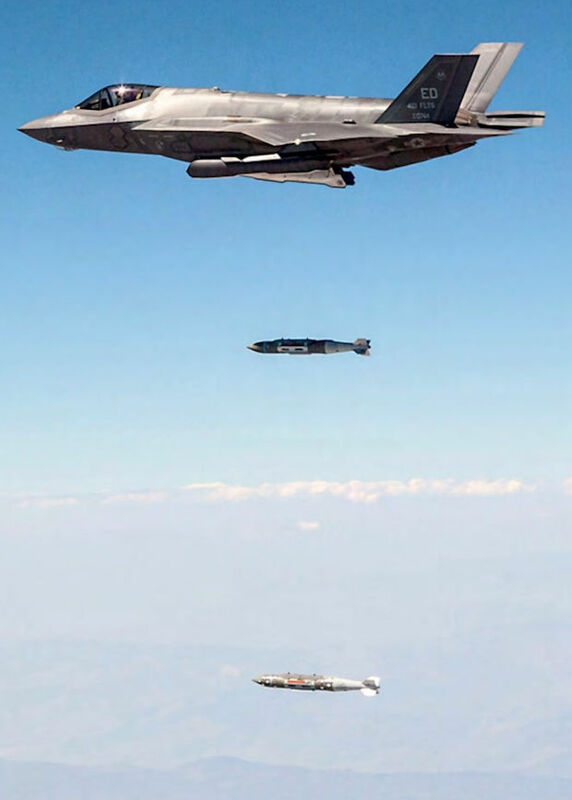 F-35A 07-0744/ED (c/n AF-06) drops an inert GBU-39/A Small Diameter Bomb air-to-surface glide weapon, over the White Sands Missile Range, during the recent weapons release surge staged from Edwards. 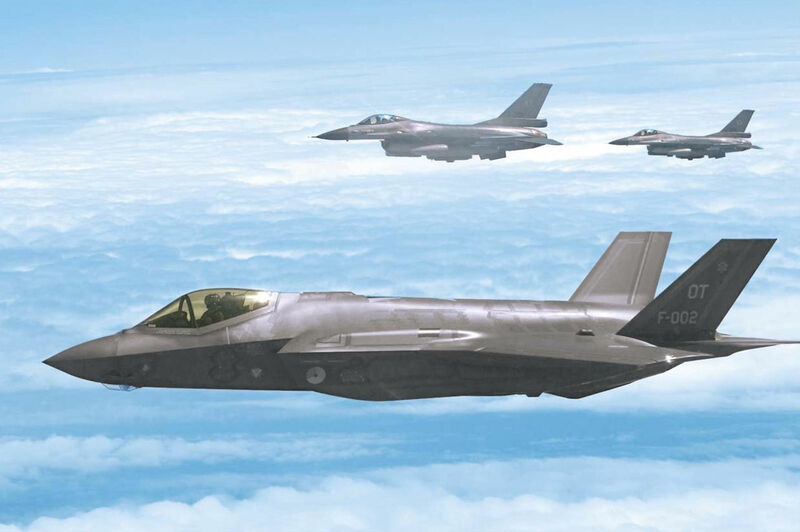 F-35A 07-0744/ED (c/n AF-06) drops two GBU-31 Joint Direct Attack Munitions, one instrumented test article (lower) and one inert (upper), over China Lake Weapon Impact Range, California. 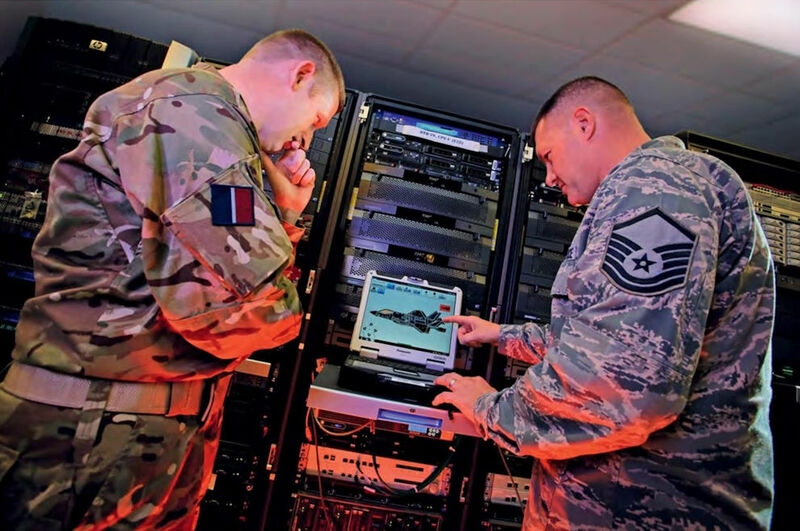 This was the first of 25 weapon releases conducted using Block 3F software during the month-long surge. 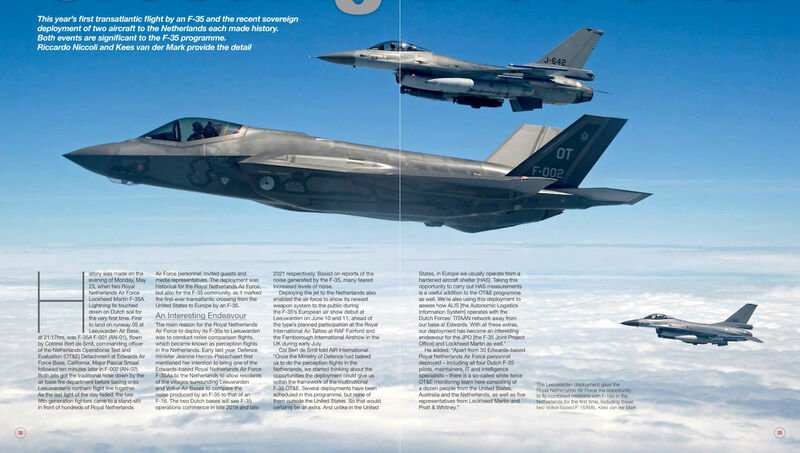 Lockheed Martin F-35A Lightning II 11-5030/‘LF’ (b/n AF-41), escorted by F-16C Fighting Falcon 84-1297 during its delivery flight to Luke AFB, Arizona, from Naval Air Station Fort Worth Joint Reserve Base, Texas, on March 10, 2014. 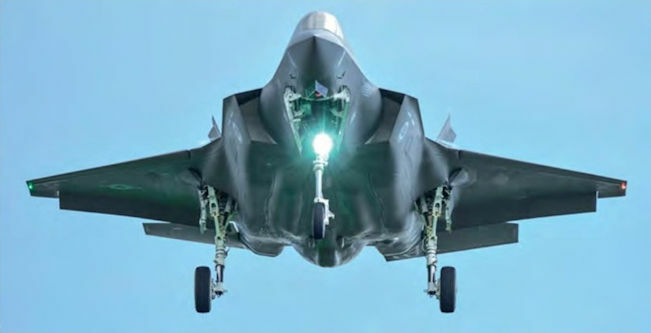 F-35A Lightning II aircraft receive fuel from a KC-10 Extender on their return to the United States after participating in the Royal International Air Tattoo and Farnborough International. 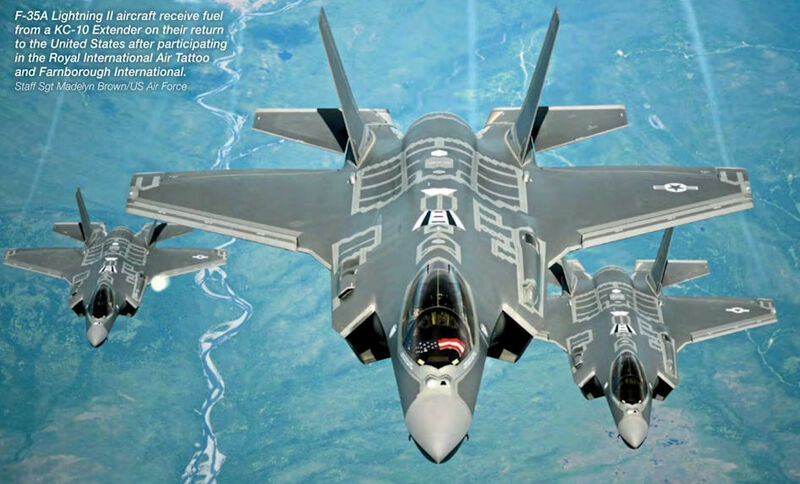 F-35A Lightning Ils from the 34th Fighter Squadron based at Hill Air Force Base, Utah, over the Utah Test and Training Range. An Eglin Air Force Base F-35A Lightning II receives fuel from a KC-135R Stratotanker over the Gulf of Mexico on March 2,2016, following the 58th Fighter Squadron's first successful munition employment at a nearby range. 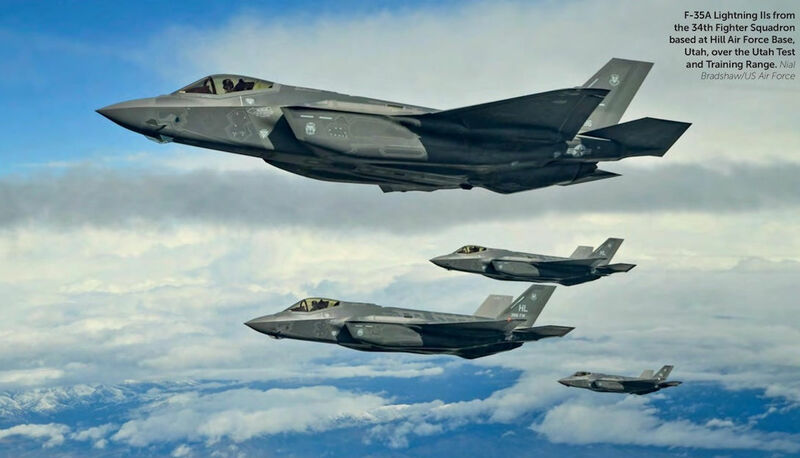 Six F-35A Lightning IIs assigned to the 58th Fighter Squadron based at Eglin Air Force Base, Florida made the type’s debut in Exercise Atlantic Trident 2017. 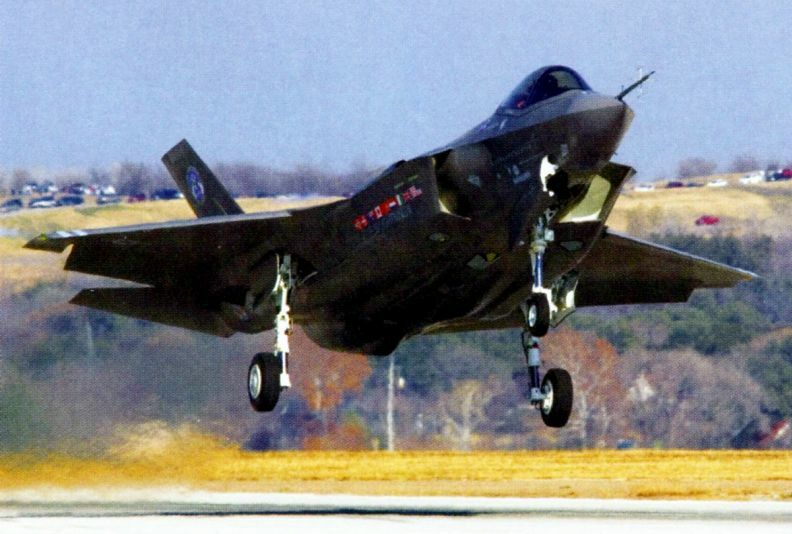 Lockheed Martin F-35A 11-5030 is the 100th Lightning II; it is seen on approach to Runway 17 at NAS Fort Worth Joint Reserve Base, Texas on December 15, 2013. 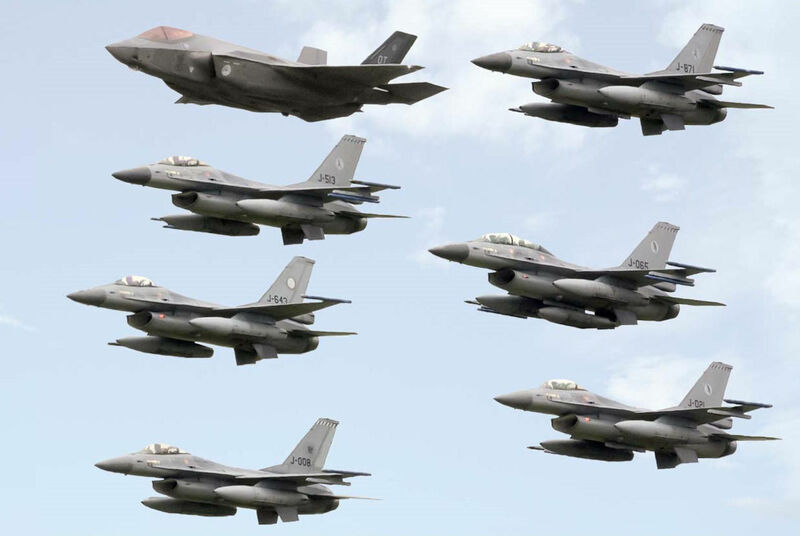 Just over 24 hours after the arrival of three F-35Bs at RAF Fairford three more F-35s arrived at Fairford on June 29, 2016. 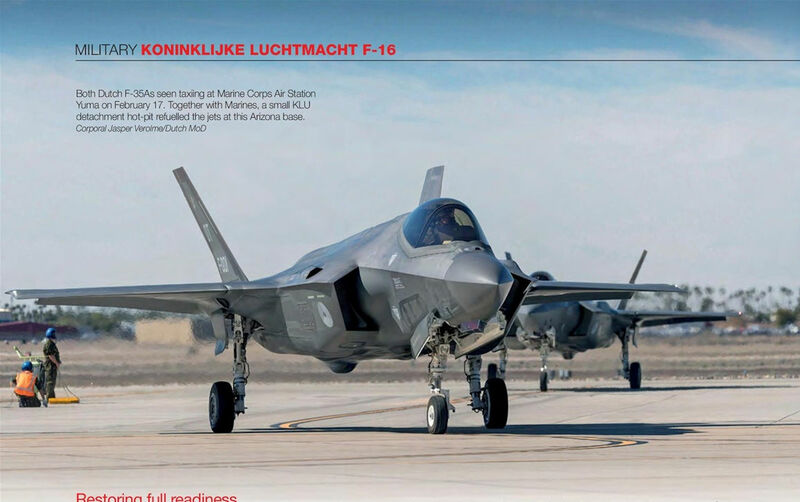 Assigned to the 56th Fighter Wing based at Luke Air Force Base, Arizona, F-35A 12-5042/LF touched down on runway 09 at 2025hrs to become the first A-model aircraft to land in the UK. 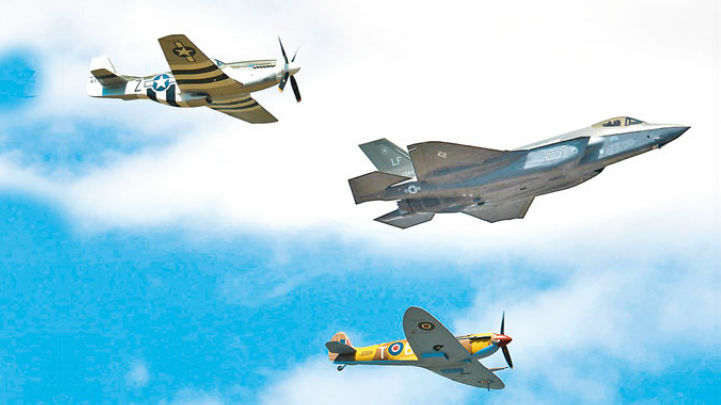 The three F-35As were flown to the UK to participate in the Royal International Air Tattoo at Fairford. 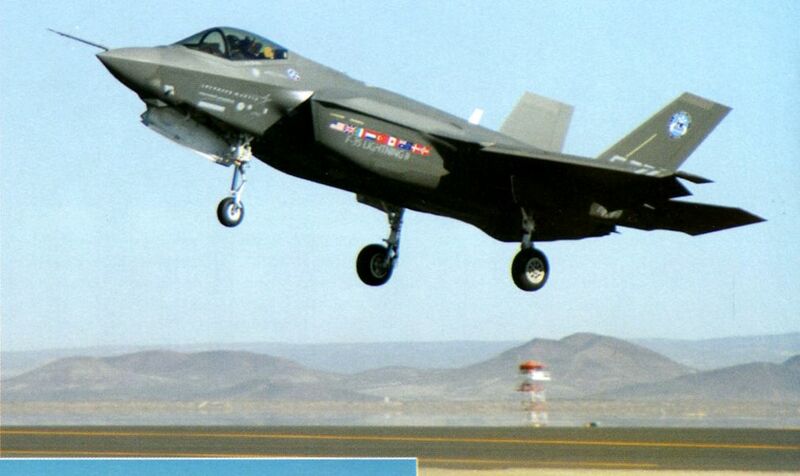 US Air Force Lockheed Martin F-35A Lightning II 13-5068/‘LF’ touches down at Luke Air Force Base, Arizona, on August 10, 2015 following its delivery flight from the factory at Fort Worth, Texas, with 13-5065/‘LF’. 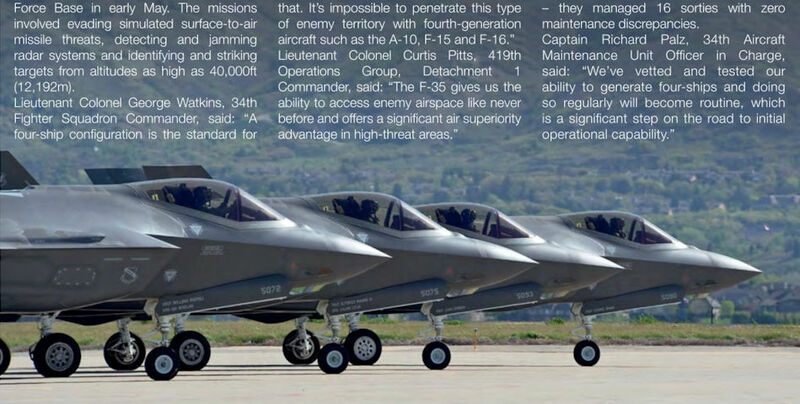 These are the first two F-35As for the 62nd Fighter Squadron ‘Spikes', which currently flies the F-16C and F-16D, but is now re-equipping with the F-35A as the second training unit at the base after the 61st FS. 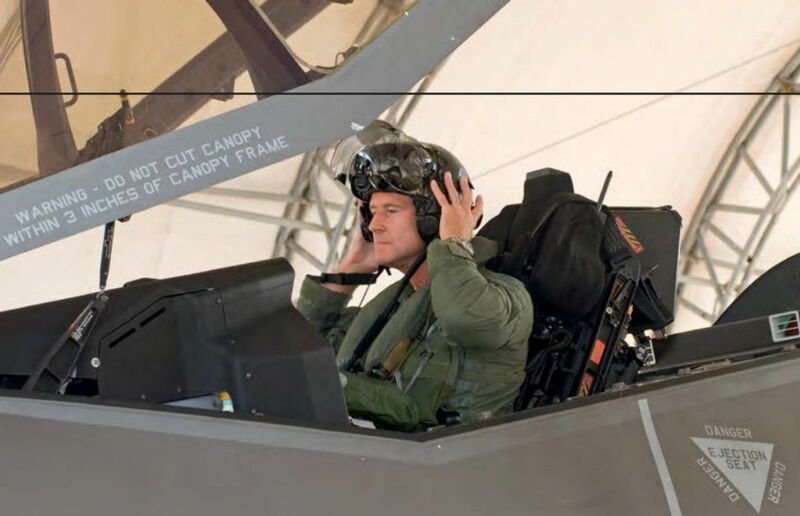 The squadron will take delivery of 18 F-35As over the next year and begin training the first class of students in March 2016. 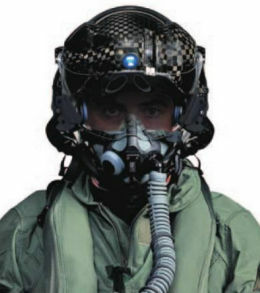 The unit will include pilots and aircraft from partner nations Italy and Norway. 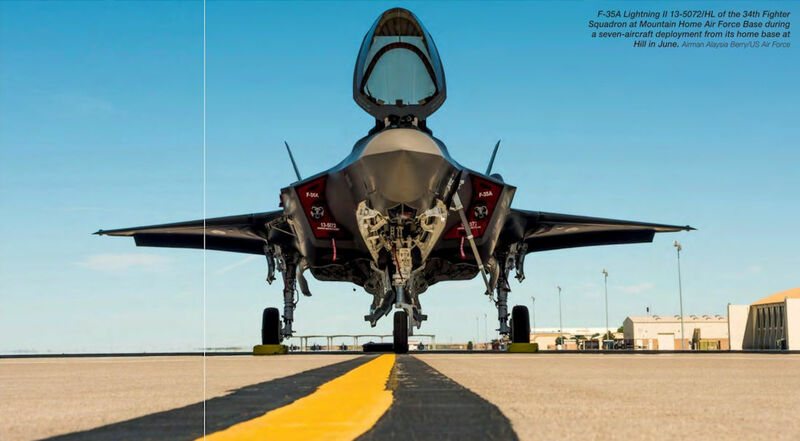 The 100th US Air Force F-35A lands at Luke AFB Arizona, on August 26, 2016. 58th Fighter Squadron F-35A 11-5023/EG and 11-5024/EG taxi to runway 30. A crew chief signals to the pilot as the aircraft emerges from one of the sun shelters used by the 33rd Fighter Wing at Eglin Air Force Base. 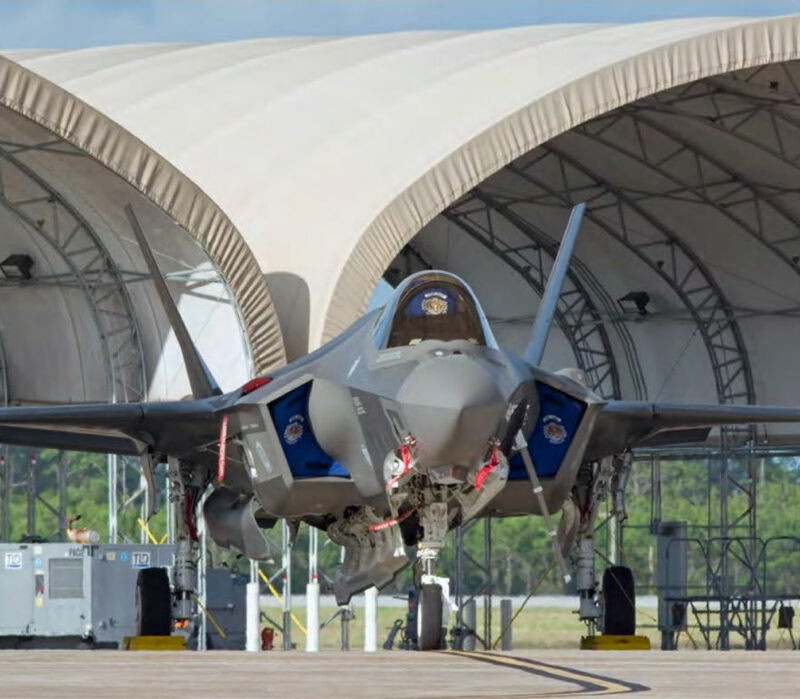 This shot of an F-35 A parked in its sun shelter on the 33rd Fighter Wing's flight line provides some perspective of the size and actuator arrangement of the aircraft's horizontal stabilisers. 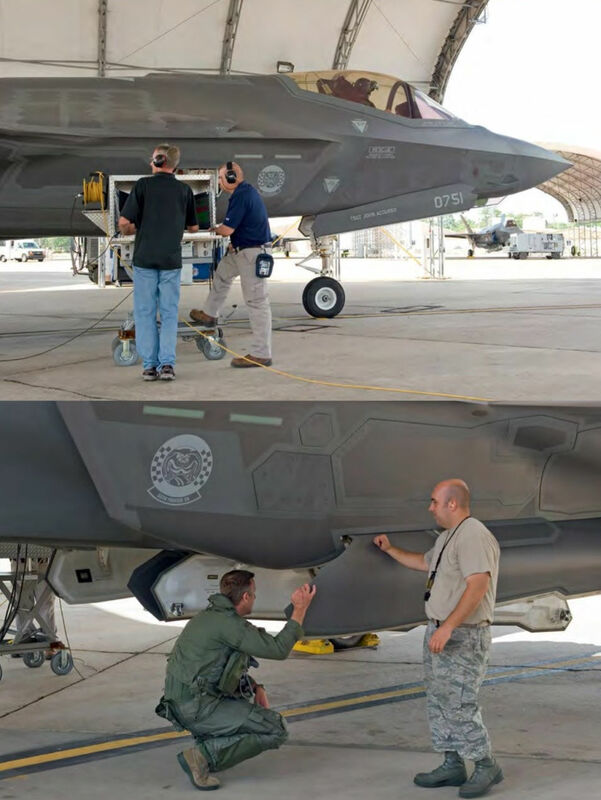 F-35A Lightning II 13-5072/HL (c/n AF-78), with tail markings for the 388th Fighter Wing commander undergoing flight line maintenance at Nellis Air Force Base on January 24, 2017. 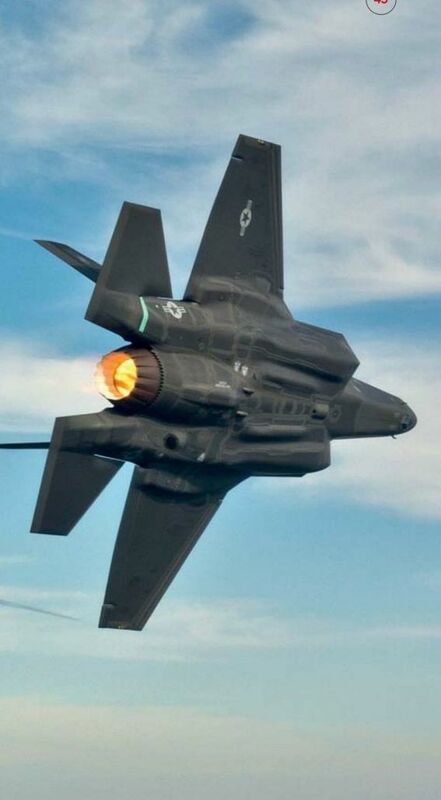 F-35A Lightning II 13-5072/HL of the 34th Fighter Squadron at Mountain Home Air Force Base during a seven-aircraft deployment from its home base at Hill in June 2016. 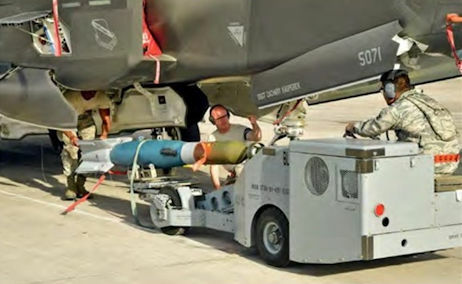 A weapons load crew assigned to the 34th Aircraft Maintenance Unit based at Hill Air Force Base, Utah, loads a GBU-12 into an F-35A Lightning II. Australia's first F-35A A35-001/AU-01, painted with the markings of No.2 Operational Conversion Unit at the unveiling ceremony at Fort Worth on July 24, 2014. 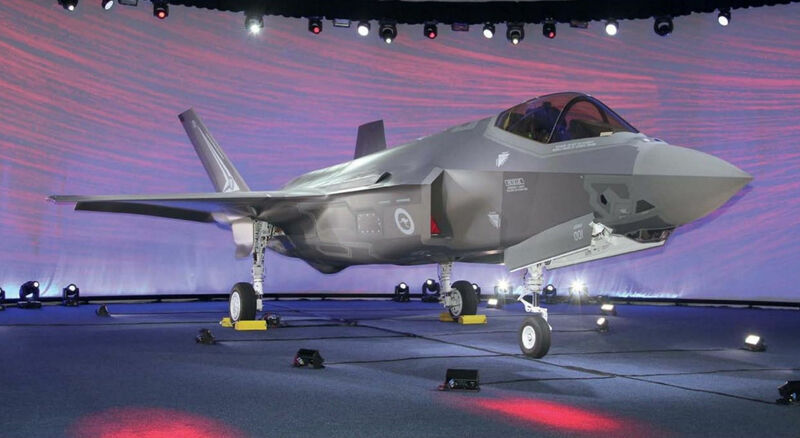 The second F-35A for the RAAF, A35-002/AU-02, provided the back-drop for the VIP morning tea after the ceremony. 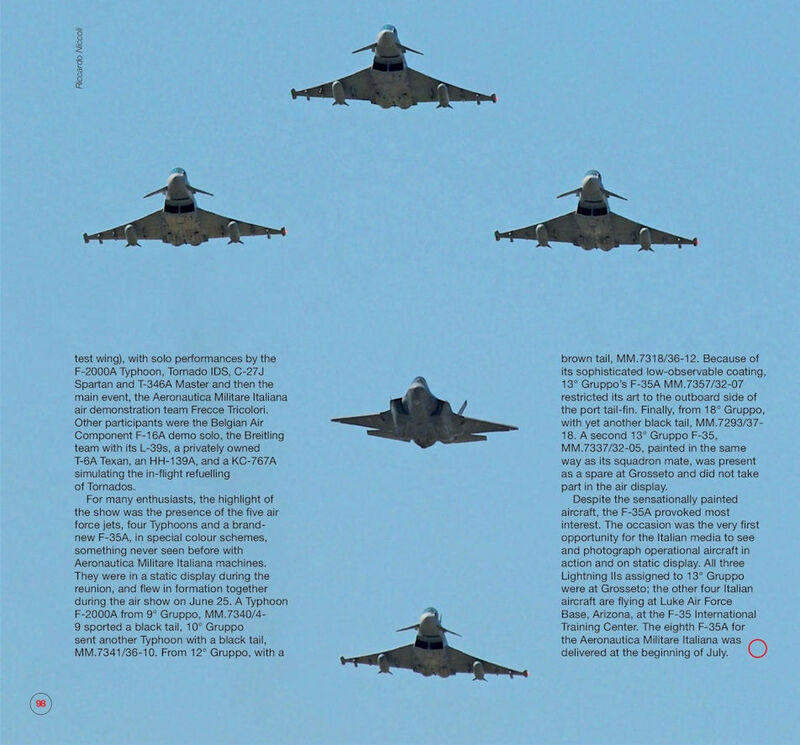 The aircraft was also finished in the markings of No.2 Operational Conversion Unit. 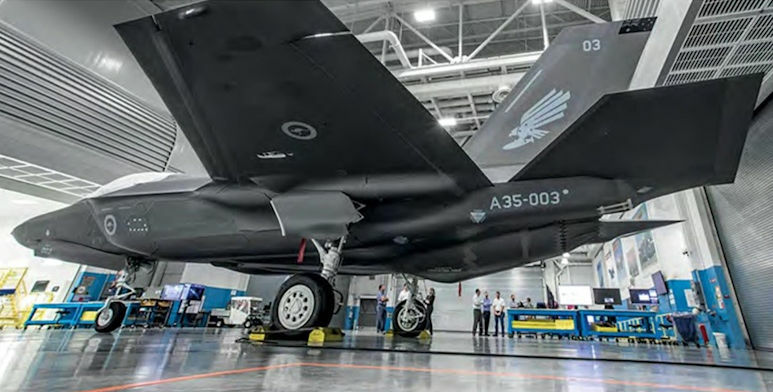 Australia's third F-35A Lightning II rolled off the assembly line at Lockheed Martin's production facility in Fort Worth, Texas, marking another major milestone in Australia's F-35A project. 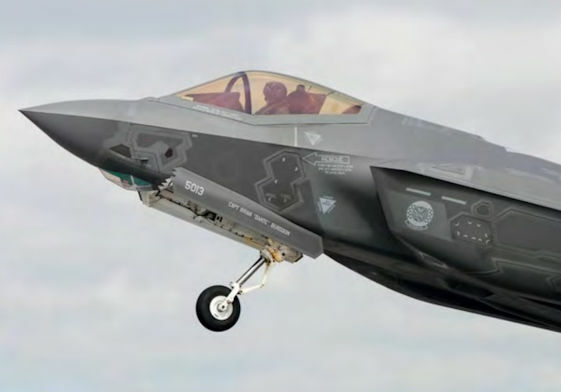 Lockheed Martin F-35A Lightning II A35-001 on its first flight on September 29, 2014. It wears the tail markings of No.2 Operational Conversion Unit. 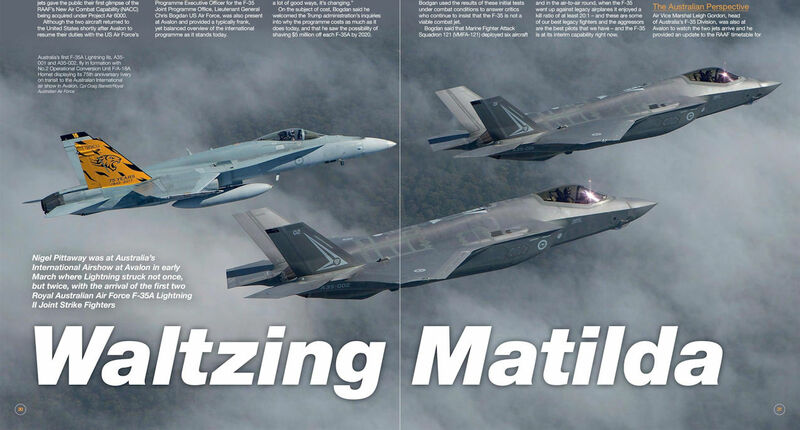 Australia’s first F-35A Lightning IIs, A35-001 and A35-002, fly in formation with No.2 Operational Conversion Unit F/A-18A Hornet displaying its 75th anniversary livery on transit to the Australian International air show in Avalon. 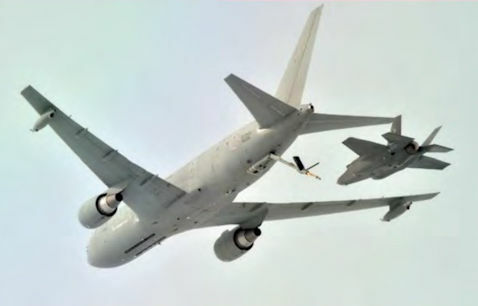 F-35A AF-04 plugged to the boom of KC-30A A39-001 during an air-refuelling flight test mission from Edwards Air Force Base on September 25, 2015. 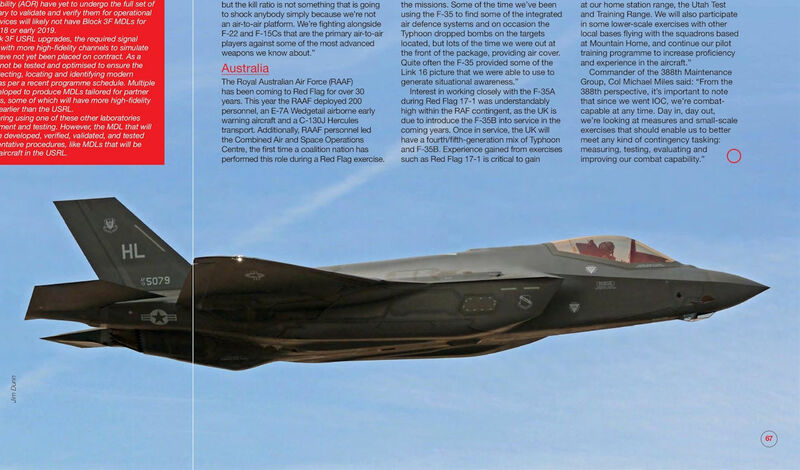 The Royal Australian Air Force currently operates two F-35A Lightning IIs at Luke Air Force Base, Arizona. 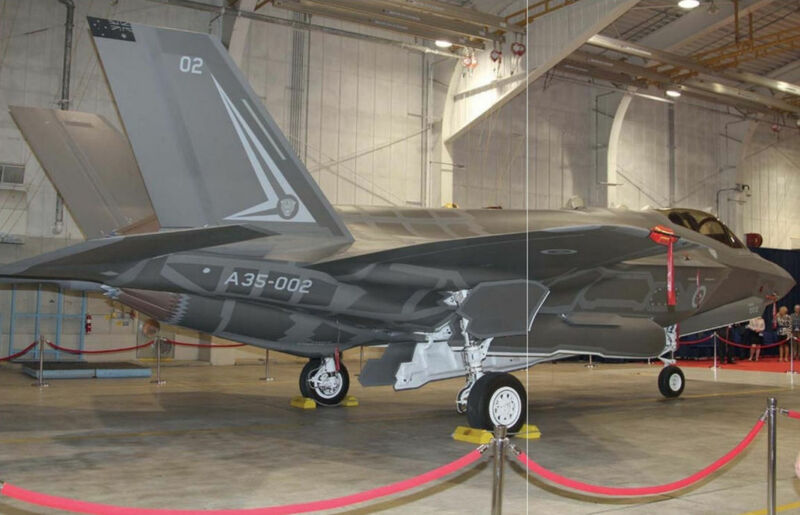 Both aircraft are painted with tail markings for No.2 Operational Conversion Unit as shown on F-35A A35-002 seen at Luke. 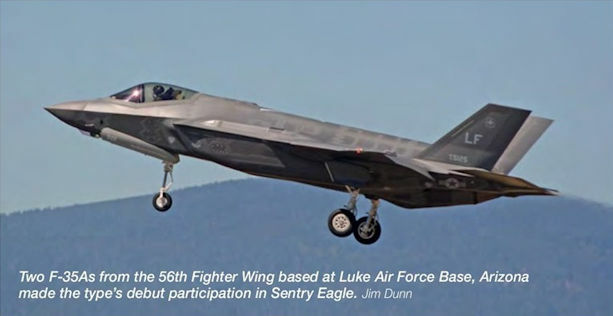 Two F-35As from the 56th Fighter Wing based at Luke Air Force Base, Arizona made the type's debut participation in Sentry Eagle. 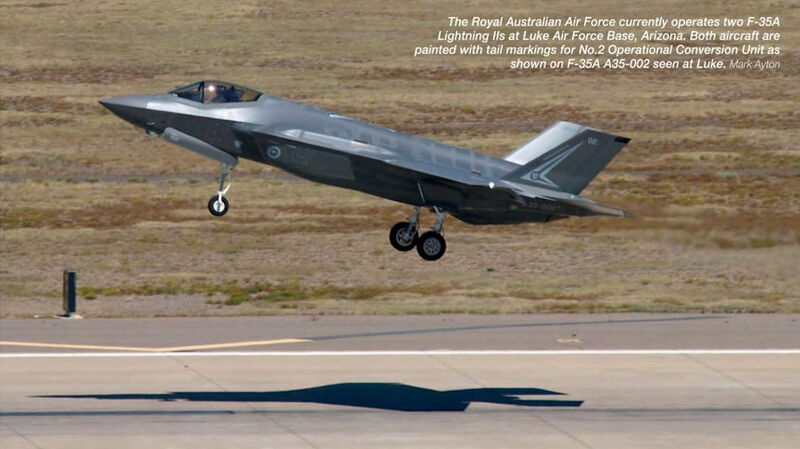 Royal Australian Air Force F-35A Lightning II A35-001 (c/n AU-01) touches down at Luke Air Force Base, Arizona, on December 22, 2014. 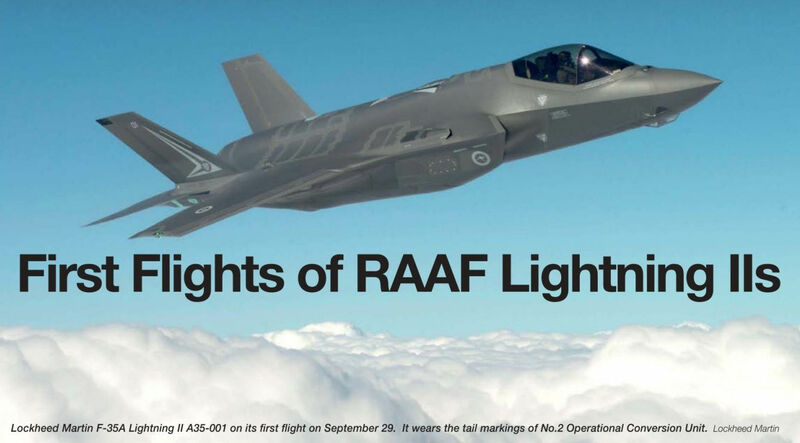 The first Lockheed Martin F-35A for the Royal Australian AU-1) is now in final assembly and due to be rolled out on July 1, 2014. 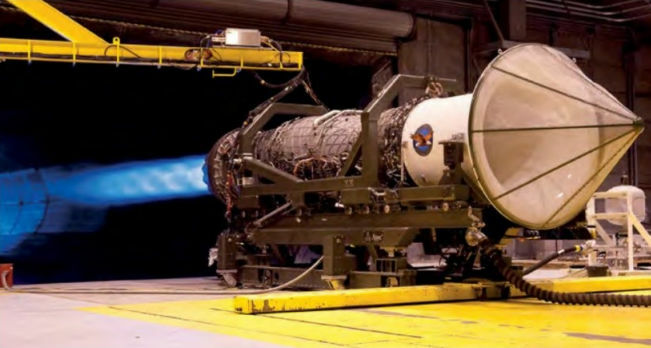 AU-1 began the fuselage ‘mate’ process at Fort Worth, Texas, on October 7, 2013, marked by a ceremony attended by Head of New Air Combat Capability Air Vice-Marshal Kym Osley. 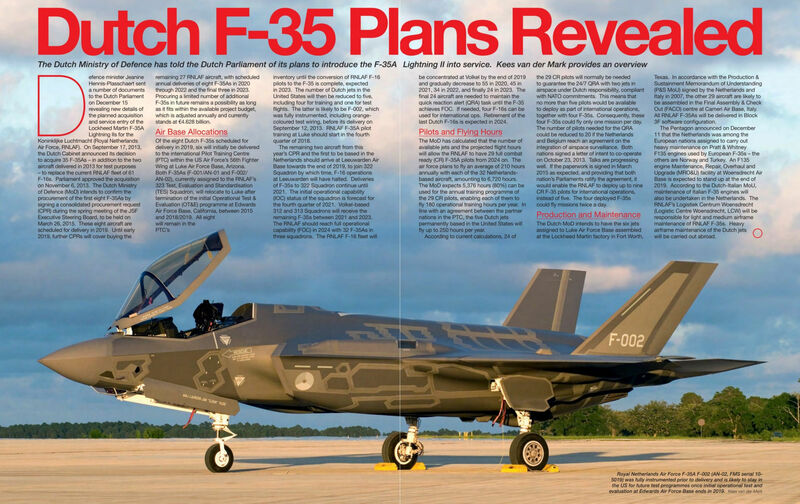 The second aircraft (A35-2, AU-2) will be rolled out on August 1 and both will be delivered to Luke AFB, Arizona, in early 2015 to support pilot and maintenance training. 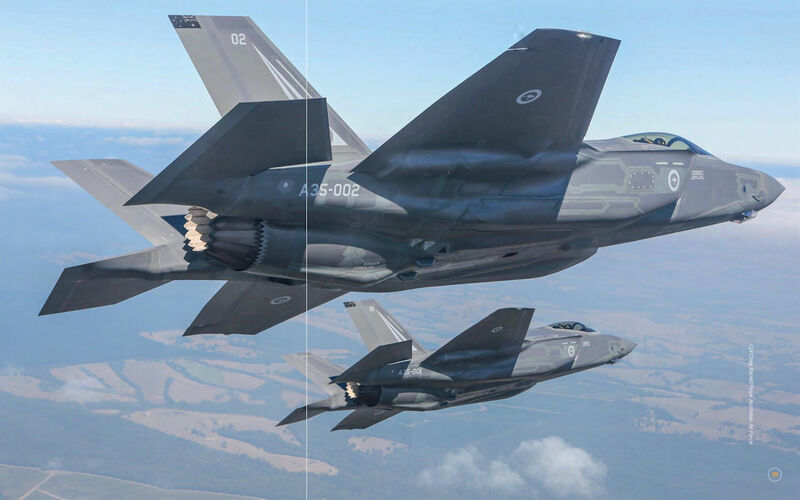 Initial operating capability for the F-35A in Australia is set for late 2020, by which time the first of three F/A-18A/B Hornet squadrons, No.3 Squadron, will have completed conversion and been declared operational. 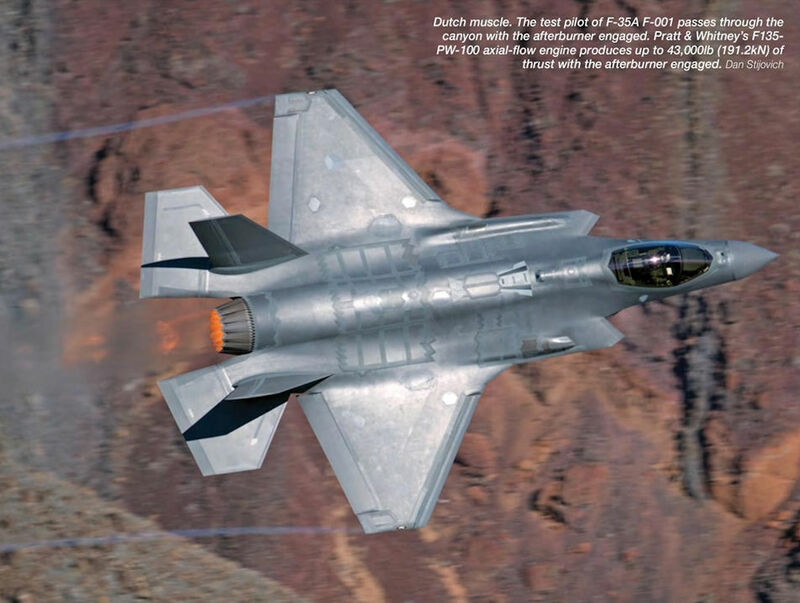 Royal Netherlands Air Force F-35 A F-002 (AN-02, FMS serial 10-5019) was fully instrumented prior to delivery and is likely to stay in the US for future test programmes once initial operational test and evaluation at Edwards Air Force Base ends in 2019. 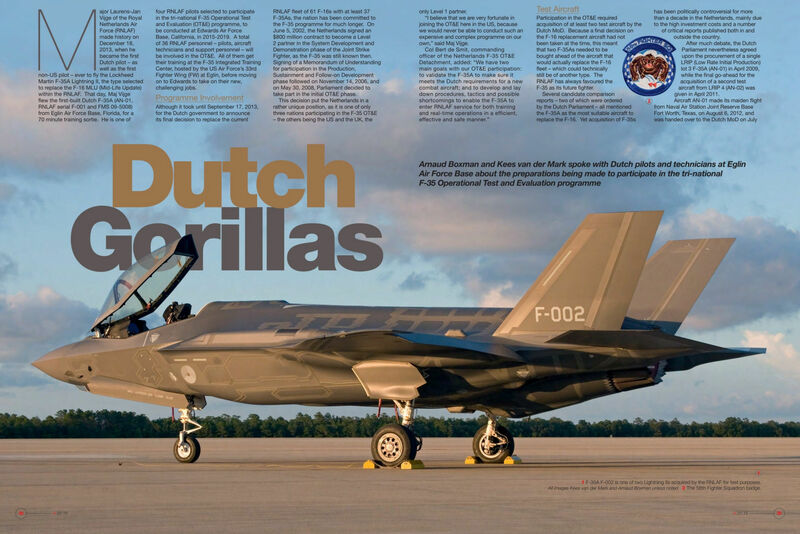 Both Dutch F-35s seen on the flight line at Leeuwarden in the early twilight following their historic arrival on May 23, 2016. 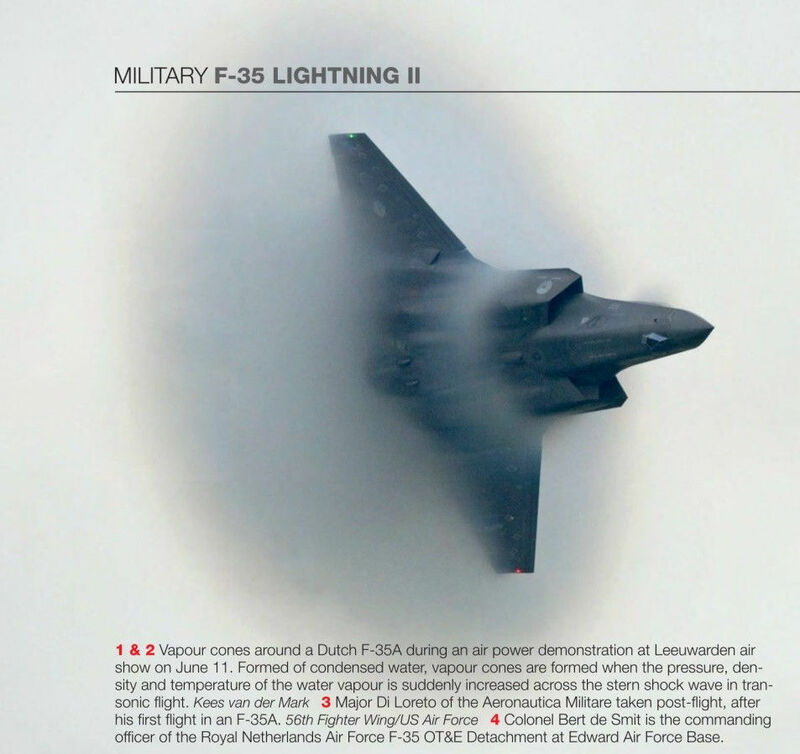 Vapour cones around a Dutch F-35A during an air power demonstration at Leeuwarden air show on June 11, 2016. 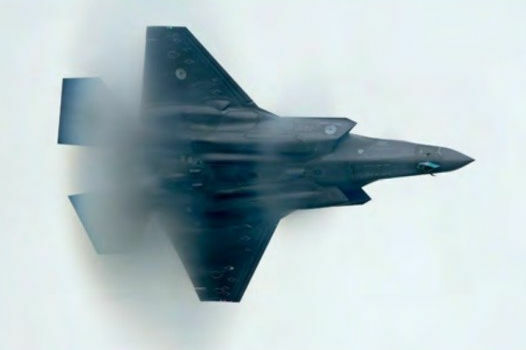 Formed of condensed water, vapour cones are formed when the pressure, density and temperature of the water vapour is suddenly increased across the stern shock wave in transonic flight. Dutch muscle. The test pilot of F-35A F-001 passes through the canyon with the afterburner engaged. Pratt & Whitney's F135-PW-100 axial-flow engine produces up to 43,000 lb (191.2kN) of thrust with the afterburner engaged. Not an official milestone for the F-35 programme, but impressive nevertheless, was a two-ship formation seen flying through a canyon in southern California on December 3, 2016. 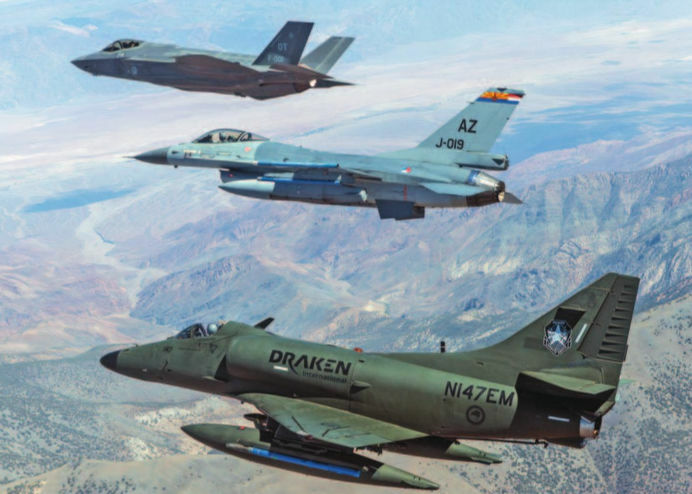 Both aircraft, F-001 (c/n AN-01) and F-002 (c/n AN-02), are assigned to the Royal Netherlands Air Force’s 323 Test and Evaluation Squadron based at Edwards Air Force Base, California; one of five test units assigned to the JSF Operational Test Team. The Leeuwarden deployment gave the Royal Netherlands Air Force the opportunity to fly combined missions with F-16s in the Netherlands for the first time, including these two Volkel-based F-16AMs. F-35A F-002 turns onto final approach as part of the perception flight in the early evening of May 26, 2016. 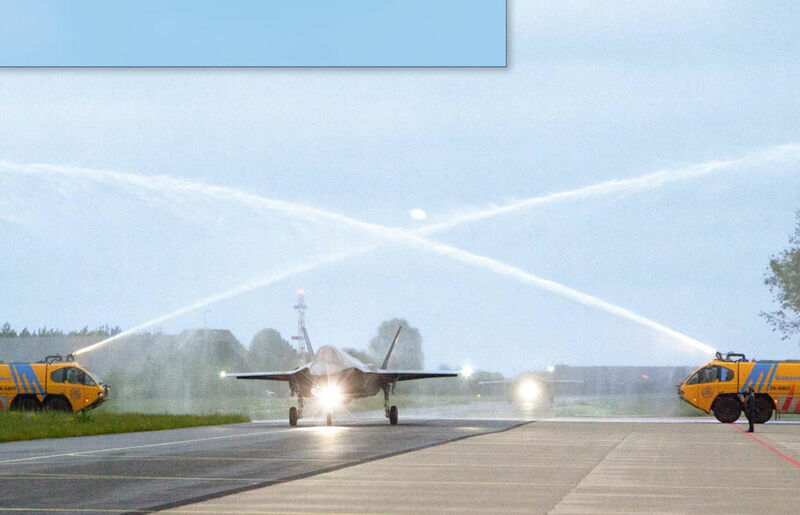 The base fire brigade welcomed the F-35s with a water curtain as they taxied to the Leeuwarden flight line. 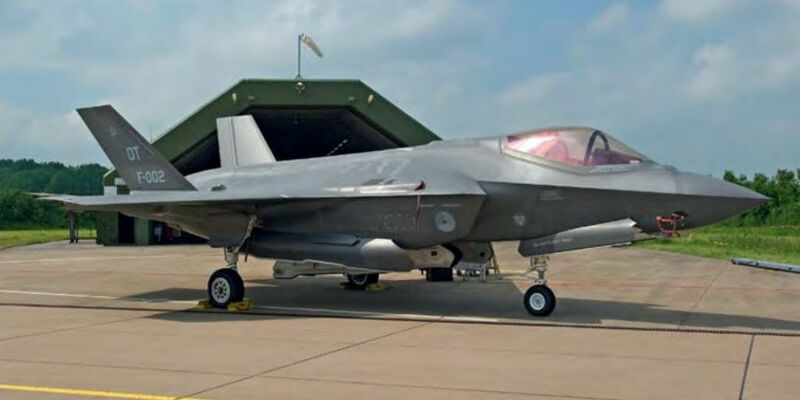 F-35A F-002 parked in front of a hardened aircraft shelter at Leeuwarden in between missions. 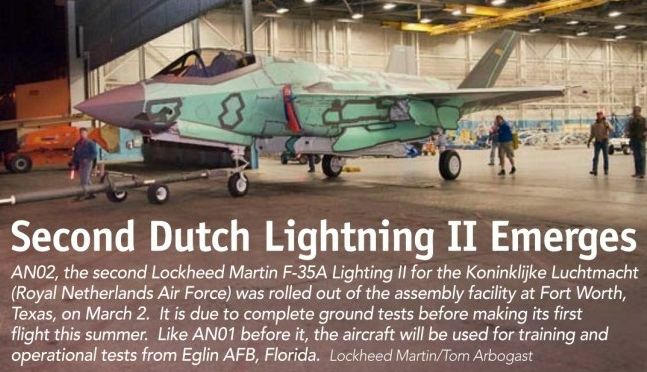 AN02, the second Lockheed Martin F-35A Lighting II for the Koninklijke Luchtmacht (Royal Netherlands Air Force) was rolled out of the assembly facility at Fort Worth, Texas, on March 2, 2013. It is due to complete ground tests before making its first flight this summer. 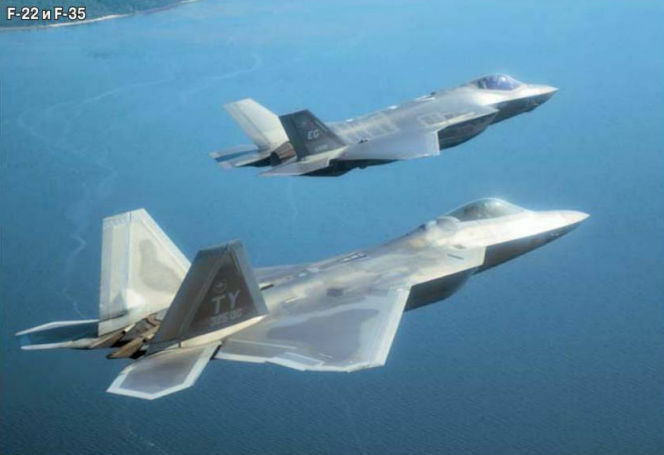 Like AN01 before it, the aircraft will be used for training and operational tests from Eglin AFB, Florida. 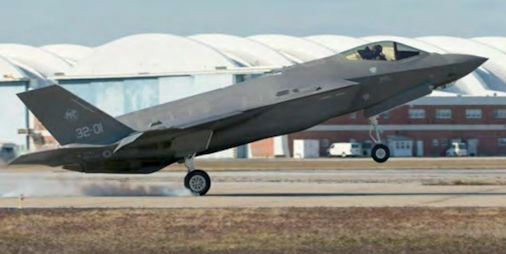 The first F-35 to be completed by the the Final Assembly and Check Out facility at Cameri, Italian Air Force F-35A AL-1, after roll-out from the production line on March 12, 2015. 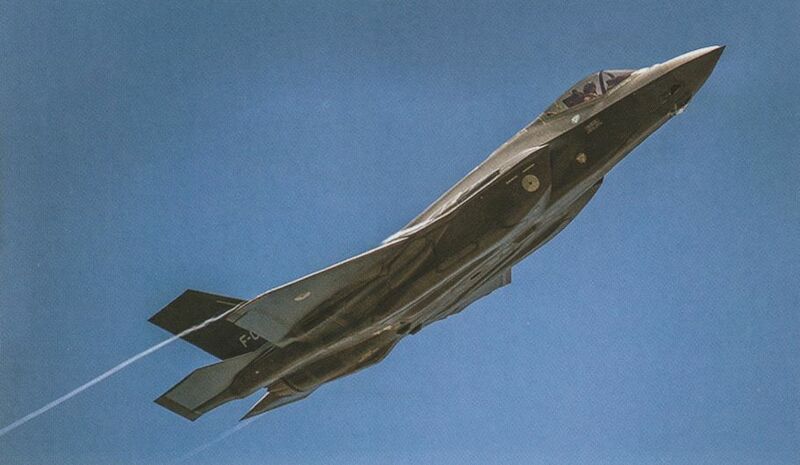 F-35A MM.7337/32-13 (c/n AL-06) is the flagship of the 13° Gruppo, the first Aeronautics Militare Italians operational squadron to fly the type. This is the sixth F-35A Lighting II built by the FACO factory at Cameri. Major Di Loreto holds the Italian flag aloft during his transatlantic flight in an F-35 on February 5, 2016. 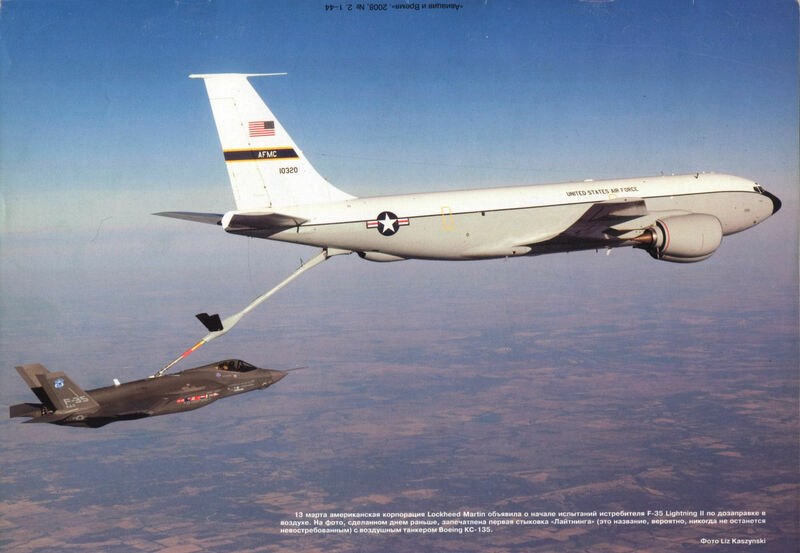 KC-767A MM.62228/14-03 transfers fuel to F-35A Lightning II MM.7332/32-01 during one of seven air refuelling brackets undertaken during 11 hours of flying between Cameri Air Base, Italy and Naval Air Station Patuxent River on February 5, 2016. 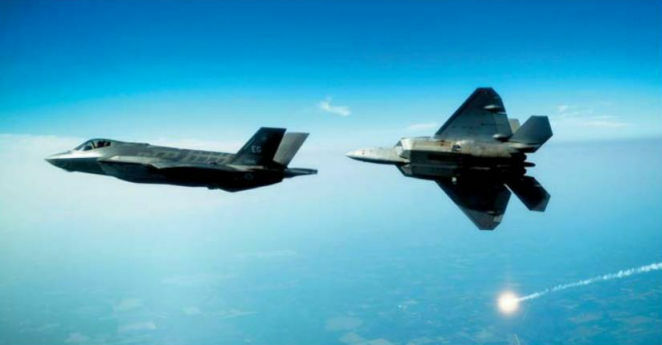 F-35A Lightning II MM.7332/32-01 in the pre-contact position behind KC-767A MM.62228/14-03 during the second leg of its historic trans-Atlantic flight to Naval Air Station Patuxent River on February 5, 2016. 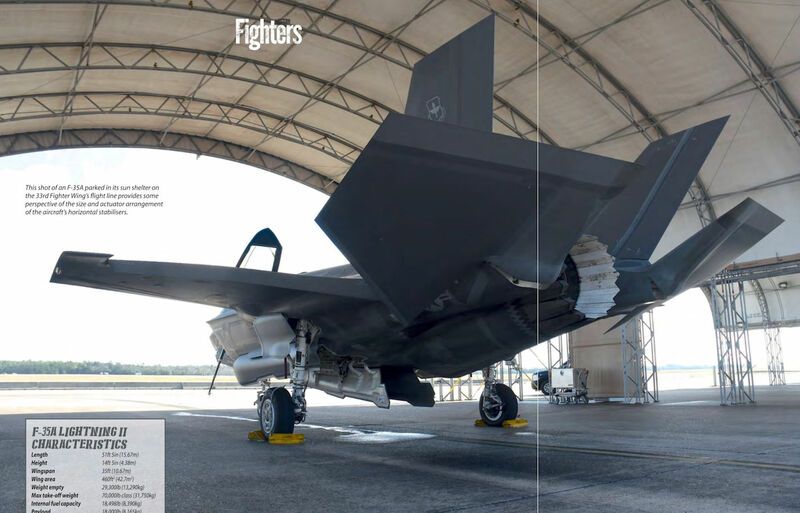 Italy became the first country outside of the United States to receive operational F-35A Lightning IIs on home soil when two aircraft arrived at Amendola Air Base on December 12, 2016. 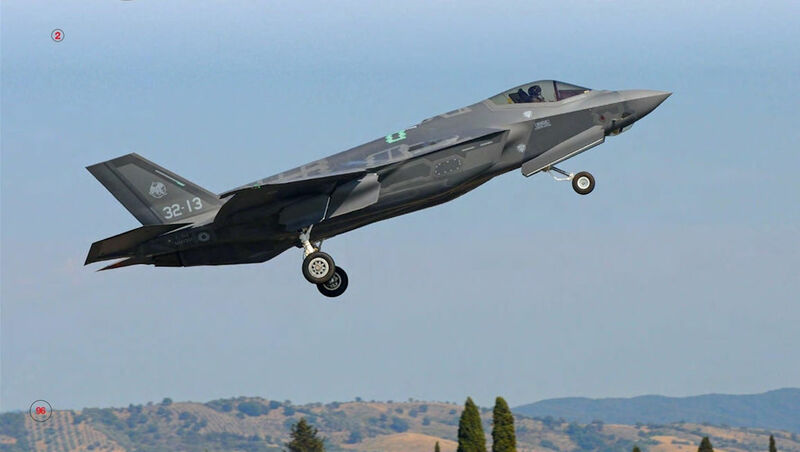 The first Italian F-35A Lightning II, MM7332/‘32-01' (c/n AL-01, US Air Force serial number 12-5062) on its maiden flight from Cameri, Italy. Aircraft AL-01, piloted by Major Di Loreto, landing at Naval Air Station Patuxent River, on February 5, 2016. Aeronautica Militare Italiana F-35A Lightning II, MM.7332/32-01 (c/n AL-01) touches down on runway 06 at Naval Air Station Patuxent River on February 5, 2016. 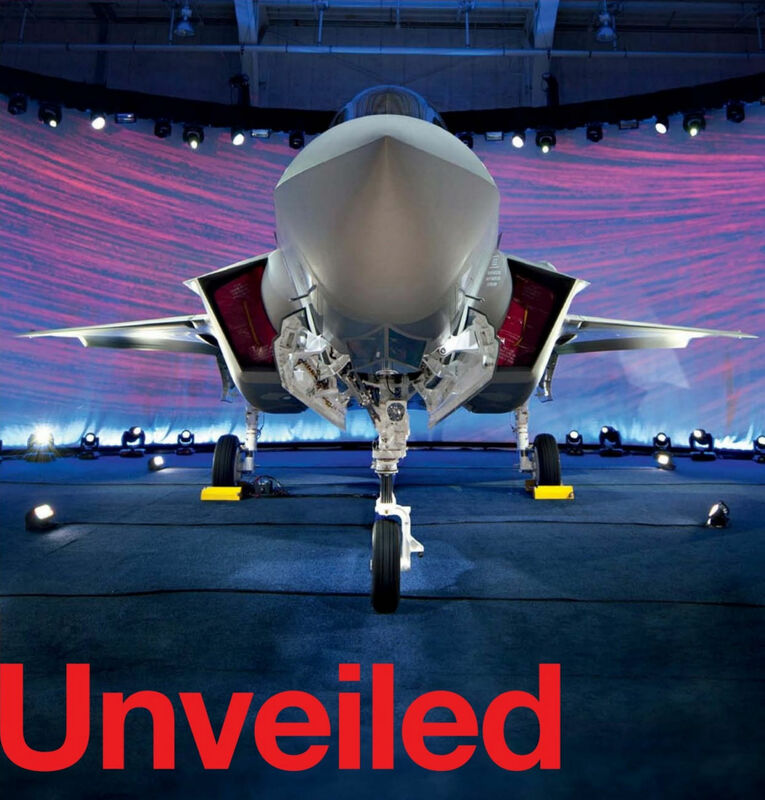 This was the first time an F-35 assembled overseas had landed in the United States. Tail art created by 13° Gruppo to mark its 100th anniversary features the legend Don Quixote and the squadron badge. These markings were only applied to the port side of aircraft MM.7337/32-05 and MM.7357/32-07. The first Italian Lightning II on the ramp at Lajes. 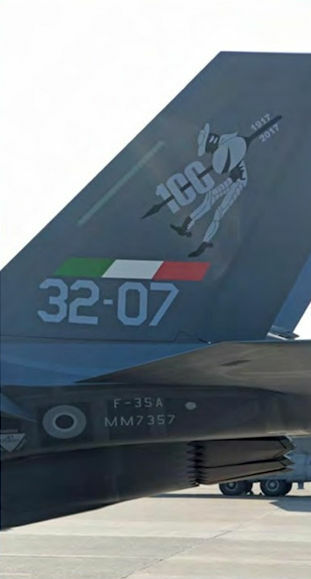 Note the 13° Gruppo badge on the air intake: the squadron was re-activated on May 12, 2016 and will be the first Aeronautica Militare unit to operate the F-35A. 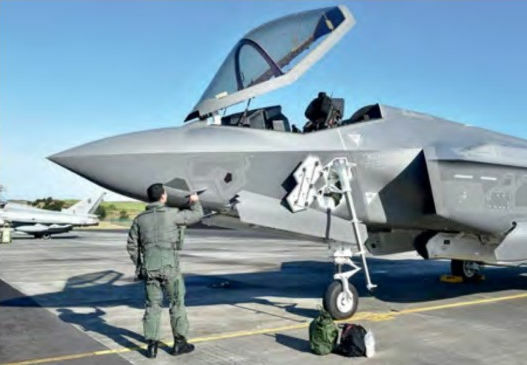 Major Di Loreto completes pre-flight checks to AL-01 at Lajes in preparation for the second leg of the transatlantic flight to Naval Air Station Patuxent River. 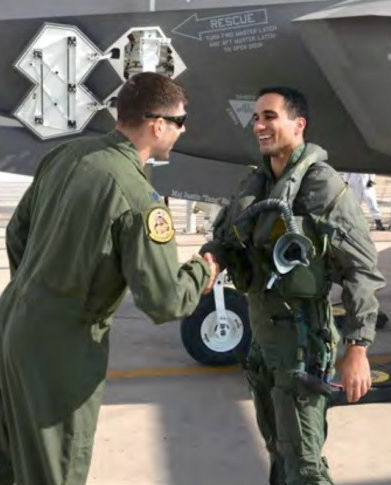 Major Di Loreto of the Aeronautica Militare taken post-flight, after his first flight in an F-35A. 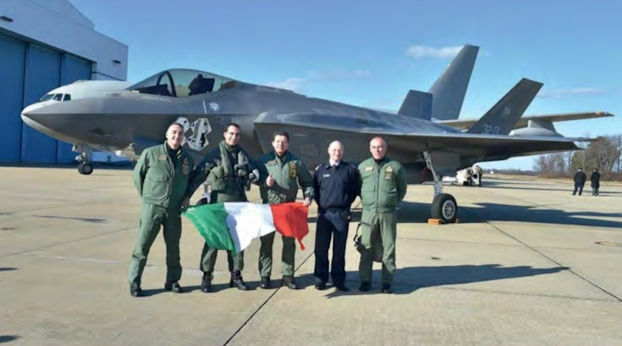 Officers from the Aeronautica Militare Italiana F-35 program office with Major Gianmarco, the pilot who flew the F-35 Lightning II across the Atlantic Ocean for the first time. 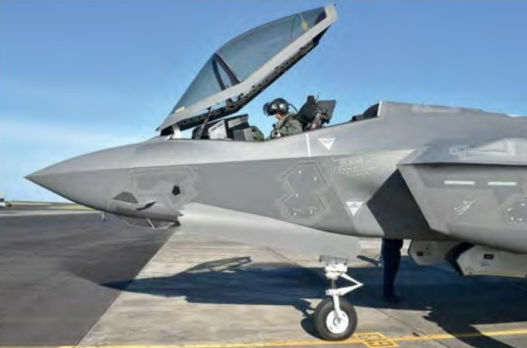 Norway's second F-35A c/n AM-02 made the nation's first Lightning II flight from Naval Air Station Joint Reserve Base Fort Worth on October 6, 2015. 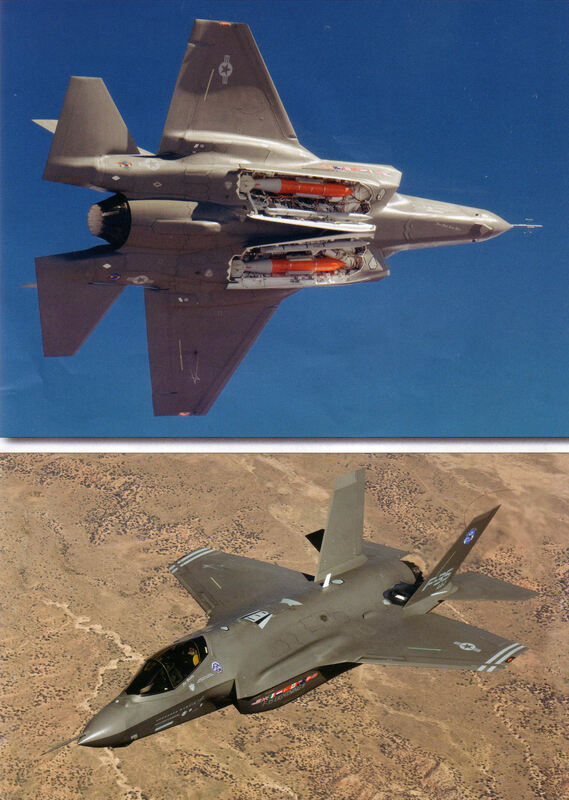 The first two F-35I Adirs for the Israel Air Force, 901 (c/n AS-01) and 902 (c/n AS-02), arrived at Nevatim Air Base on December 12, 2016. Aircraft AS-02 completed its first flight on August 8, 2016 from Naval Air Station Joint Reserve Base Fort Worth. 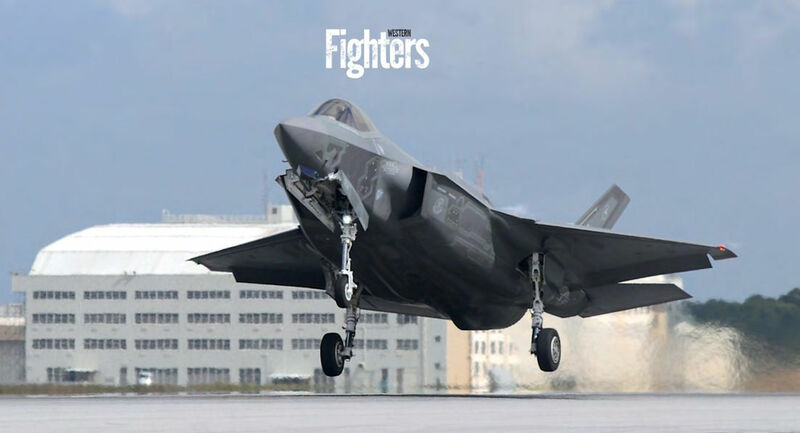 Japan's second F-35A, 69-8702 (c/n AX-02) made its first flight from Naval Air Station Joint Reserve Base Fort Worth on November 30, 2016. 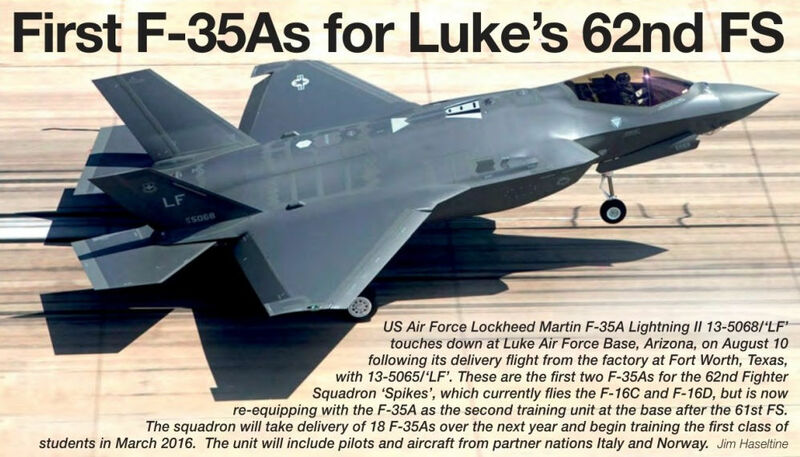 The aircraft will be delivered to Luke Air Force Base to join the international training programme. 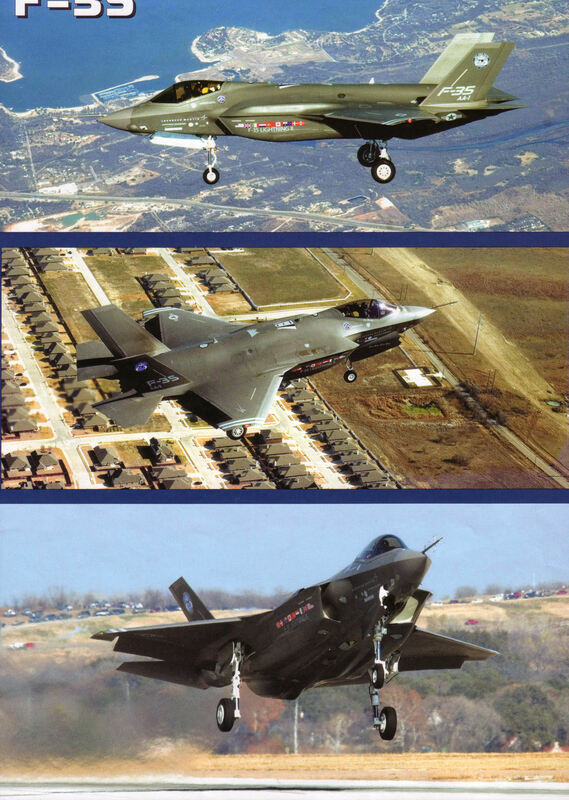 Japan Air Self Defense Force F-35As 79-8703 (c/n AX-03, FMS 14-5116) and 79-8704 (c/n AX-04, FMS 14-5117) on approach to Luke Air Force Base, Arizona, during a joint mission on February 24, 2017. 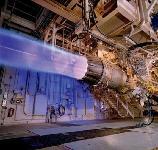 Для истребителя пятого поколения F-35 Lightning II компания "Pratt & Whitney" разработала двигатель FT35, имеющий тягу на форсаже 7 55,65 кН и устанавливаемый на все три модификации данного самолета - F-35A, F-35B и F-35C.